Saleleni was born into a difficult situation. When she was small, Saleleni and her twin sister moved around a lot, living with grandmothers and great-grandmothers after her parents separated. Many times there was no food for the children to eat and they survived on the kindness of teachers and neighbours to give them food on many occasions. School was very difficult for Saleleni as she struggled with a learning disability. This led her to drop out in grade 9. At the age of 20, she got married and sadly within a few years her husband died after numerous medical issues. Her in-laws chased her out of the house and she had nowhere to go. Over the next few years she was living on the streets, sometimes staying with family - but wherever she stayed she was eventually chased away. Eventually by the grace of God, she was able to build a small tin shack and begin to make a little bit of income by doing laundry and babysitting. At this time, her mother had two other children that were not being taken care of. One of the boys were sent to Saleleni’s twin sister and the other was staying with another lady. When this lady passed away, Saleleni decided to take in her brother Lawrence and care for him. Shortly after, Saleleni fell in love again! However, it wasn't to be. He was abusive to her and finally last year, after many years - with the help and support of the church, she decided to leave the situation. Life has not been easy for Saleleni – But God stepped in and rescued her where she was at. She now cares for both of her teenage brothers. Although she wasn't part of the church, her brother Lawrence was part of the ChildCARE Plus program. That influence led her to learn more about God and she was chosen to attend sewing school this past year, through an ERDO supported project. With a learning disability, no high school diploma, no skills, and no church membership, God stepped into her life and Saleleni is a changed person. She accepted Christ last year and says that He has made all the difference. 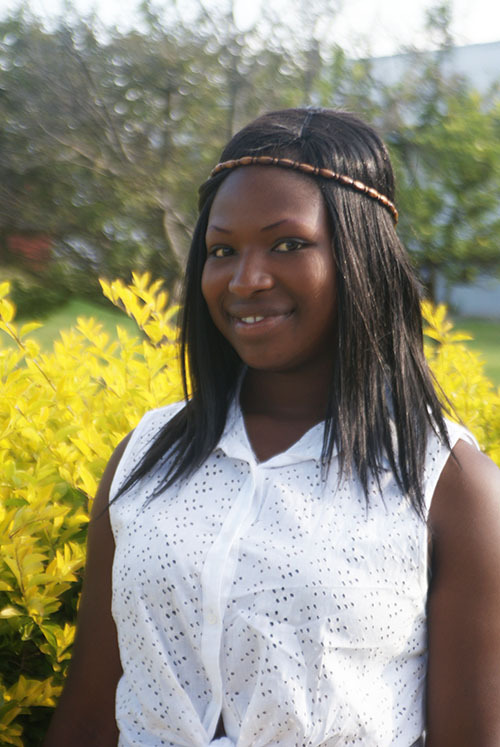 She has joy, she has peace and she is now empowered and equipped as a fashion designer! During her sewing lessons, as the ladies shared and prayed together, she decided she was no longer 'Saleleni' which meant left behind but would use her other name, Caroll. - a new name, a new life, a new beginning. She has now graduated from the discipleship course and sewing school and is already part of a co-op 'factory' that is sewing school uniforms for the community, and children in the CCP program. Sometimes it’s difficult to know what to write to your sponsored children. You aren’t quite sure what to make of the new relationship you have built with someone who lives so differently from you. So how can you make genuine connections if we you are limited by time, distance, and culture? Here are some tips to help you know what to say next time to you pick up the pen to write to your sponsored child. DO - Let them know you’re rooting for them. Many of these children face circumstances we can’t even imagine. Letting them know that you’re in their corner is a great way to build their confidence and gives you an opportunity for a connection. For example, you could ask what their favourite and least favourite topics in school are. If they say they don’t like math, you could offer words of encouragement. One might say, “I didn’t like math at first either, but now I use it every day! The more you practice, the easier it gets! You are so smart so I know that it will be easy for you soon!” In future letters, you can continue to ask them how math class is going and offer them more encouragement. DO – Talk about seemingly mundane topics. The recent weather, what your hometown is like, and what your family is up to that month are all great topics of conversation. Not only can that open doors to more interesting discussions, but it also gives your sponsored child the basic information they need to start to understand what your life is like. Additionally, many sponsored children live in agricultural societies, where they have built strong relationships with nature. They will be interested to learn about what your seasons are like, how your garden is doing, and the geography of your city. DON’T – Get too personal. 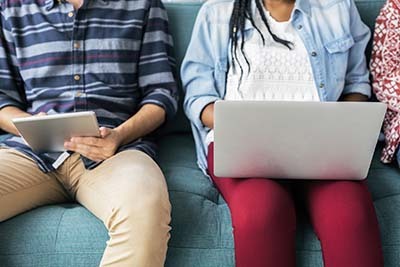 Never share your personal mailing address, your phone number, any financial information, or any of your social media pages with your sponsored child. This is not only for your protection, but also for theirs. Additionally, overly affectionate letters can be inappropriate in the child’s culture. DO – Remind your sponsored child that you are thinking of them. Do this by saying it outright and bringing up topics discussed in previous letters and ask for updates. This will make the child feel listened to and validated. DON’T – Make any promises you can’t keep. Don’t tell them that you might come visit ‘sometime’ or that you will send them something that you can’t send. We encourage sending photographs and postcards, but large gifts are not allowed. Don’t worry though, we give sponsors the option to give extra for Christmas and birthday gifts. Global workers in the area who know the child’s needs and wants will pick out the perfect gift for them. DO – Be sensitive to their culture! Your sponsored child experiences the world completely differently than you. It is important to keep that in mind, not only to make your letters more relatable, but also to ensure that you are not offending them or their community. It is important to avoid topics that imply status or wealth like traveling, fancy cars, new purchases, etc. Even topics like keeping household pets can be a foreign concept to some children. Try to be mindful of your child’s cultural context! DON’T- bring up upsetting topics. The point of these letters is to encourage and uplift the sponsored child. If there is an indication of a tragic or upsetting element in the child’s life (death of a parent, addiction in the family, etc.) in their bio, do not bring it up in a letter. If they bring it up, try to keep your response as hopeful and positive as possible. Furthermore, if you are experiencing something upsetting (death in the family, illness, etc.) refrain from sharing that information with your sponsored child. Keep your letters positive and uplifting for their sake. DO – Share your walk with the Lord. Give them your favourite bible verses, let them know you’re praying for them, or just tell them that God loves them. The simplest things can make the biggest difference in a child’s life! Hopefully, you found these tips useful and they help you to build a strong relationship with your sponsored child. If you have any questions, check out our ChildCARE Plus FAQ page or give us a call at 1-800-779-7262. Happy writing! What's it like working at ERDO? I was blessed with the opportunity to work with ERDO as the Research and Development Assistant. In my position, I was working primarily with David Adcock (CEO of ERDO), doing research projects and interacting with our Global workers all around the world. My work included things like: booking appointments, managing his calendar and preparing for meetings. Additionally, I worked with our Resource Development and Marketing teams on research and the ERDO website. On my first day, I felt truly welcomed by friendly staff and an inviting atmosphere. ERDO staff have been positive and willing to help me during my internship. One thing that really stood out to me was the time and effort put into making sure employees have chances to grow. The genuine personal care for employees is refreshing. Knowing that the work you are doing every day is helping people around the world is so incredibly fulfilling. This was my first office job, I have learned so much and have had many first experiences with ERDO. Starting something new can be overwhelming at times but through this internship I have learned that it’s ok to make mistakes if you learn from them. I have been able to learn so many transferable skills such as: working with excel, word, taking notes, working in groups, working under pressure, meeting deadlines and time management. My main goal for this internship was to learn new skills and assert myself; I feel great having accomplished these goals. Working with ERDO has been a very well rounded experience. Being able to work with the different departments and people around the world, seeing the multiple aspects of ERDO and how they all work together to help others. Strengthening my perseverance and learning so many transferable skills has been amazing. This job has made me even more interested in missions and I am hoping that I will be able to use my degree in Criminology to help with humanitarian issues in the future. I pray for continued success for ERDO and for everyone we work with around the world! Check out our exciting summer opportunities here! Vicki is a former sponsored child who was part of the ChildCARE Plus program in the Philippines for many years. She comes from a large family with nine children, and also has a twin sister. Sadly, soon after her birth, her mother passed away and her father was left alone to care for the nine children. He worked hard in the rice fields as a labourer, but did not have the means to provide milk and proper food to the twin babies. As a result of this, Vicki and her twin sister became malnourished and weak. At 10 months old the girls went to live at Noah’s Ark Children’s Home where they were able to receive the care that they needed in order to thrive. Vicki did very well during her time in the home, and was able to have a pleasant and fruitful childhood. She graduated with honours from high school, and recently graduated with a degree in Medical Technology. 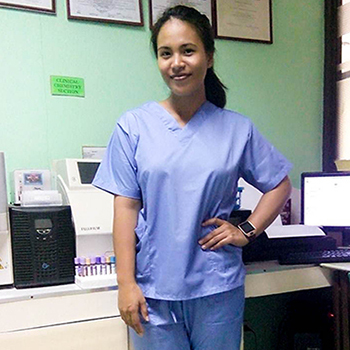 Vicki is now self-sufficient and is working as a medical technologist in a local hospital. 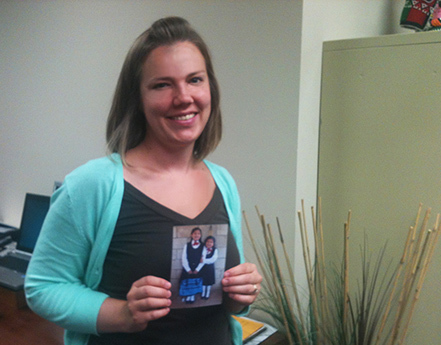 Vicki is living proof of the deep and lasting impact that our sponsorship program has! This International Women's Day, sponsor a child and help empower the women of tomorrow. Take a look at our new homes! 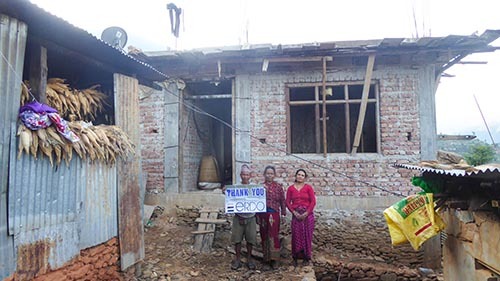 Since the Nepal earthquake in 2015, we have been helping families who lost their homes through a community housing initiative! 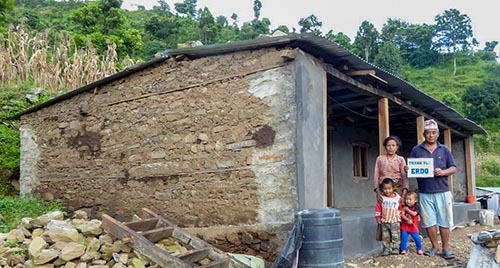 28 families now have new disaster-resistant home! Take a look at a few of the new homes! We have heard of some situations where compassionate people, from healthcare and charity sectors have been targeted for money through Facebook and online funding platforms. The stories are detailed and authentic sounding pleas for help, with heart wrenching stories of constant struggle, loss, costly hospital bills, and starvation driven suicides. These stories tap into people’s good will and desire to ‘do good’. In a world with so much need, it is understandable that many of us are moved to acts of compassion. And with the increase and accessibility of social media, it is understandable that those facing difficult situations would seek to use it as a tool for spreading messages of dire circumstance and need. While we have sympathy for the plight of people living in developing nations, it would be wise to be cautious of requests that come through social media for funding of personal circumstances. Especially when the person is unknown to you and there is no personal connection or trust. Steer clear of pages with minimal information. Ask yourself, how the person got your name to reach out to you in the first place? Perform a reverse image search with Google. A ton of results would suggest that it is probably a stolen photo used for a fake profile or campaign. Check the campaigner’s social media presence. Be wary if they only have a few posts, or only a few friends. Schemers tend to make fake profile pages right before they make fake campaigns. Reach out and contact them directly. 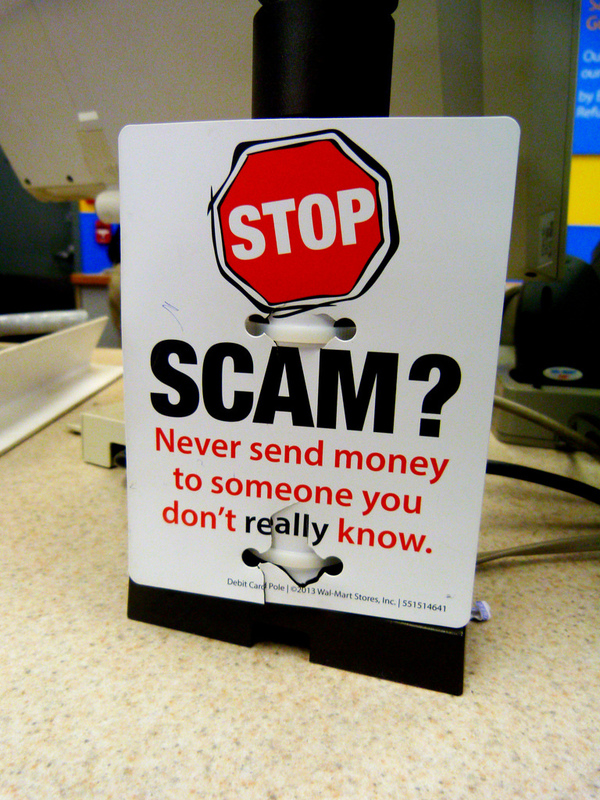 Scammers will either not respond, or send more false information or documents that hopefully you can easily spot. Donating through registered charities where there is transparency and accountability is one way of ensuring your donation will help where and who it is intended to benefit. Going this route has the added benefit of protecting both the privacy of the donor and the beneficiaries that we serve. Here at ERDO we work in over 35 countries with trusted partners and agencies, and with those who are already working in the communities we seek to serve. 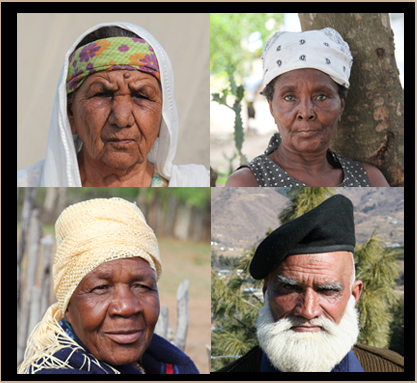 We endeavor to understand the real need and to build relationships with local people, while honoring their wisdom and experience. Following best practices to ensure long-term success and sustainability is our standard. Before you give to any cause, be confident that you can trust where you are giving, and that the finances you give will be used wisely. My name is Nzinahora. I am a born again Christian and a mother of four children. I am married, but my husband is an alcoholic and was abusing me physically, so I took my children and have separated from him. When life can’t give its best fruits, tangible aspects become painful. As a mother, my hope had disappeared and was replaced with fear and disaster. My husband had stolen my savings, so the only money I had to operate my business was borrowed from a friend. I came to know Wezesha through friends who were part of the project. They shared the good news about Wezesha with me. They explained to me how Wezesha is a Christian microfinance program that supports hard-working women to enable them to improve their lives. I immediately formed a group of five women, attended the three-day training, and received my first loan. My life has totally changed since I began working with Wezesha. My business of selling avocados has totally expanded. I buy avocado trees upcountry and sell them in Bujumbura. Now I am able to pay for my children’s school fees. I also recently opened another business of selling pork meat in the Kamenge neighbourhood. I am making a good profit. With the loan I received from Wezesha I have also been able to buy two plots of land upcountry and still have enough to further expand my business. Thank you to the Wezesha staff who prays for us and visits regularly to encourage us. Rohingya refugees who have fled to Bangladesh after experiencing extreme violence in Myanmar will receive life-saving assistance thanks to the $12.5 million donated by Canadians for relief activities, and matched by the Government of Canada’s Myanmar Crisis Relief Fund. $1.1 million of that total was donated to Canadian Foodgrains Bank and its member churches and church agencies by Canadians, with $276,000 being donated directly to the Foodgrains Bank. “Canadians continue to show themselves to be generous and compassionate people. Their contributions will help our partners respond to the increasing humanitarian needs in Myanmar and Bangladesh with a strong focus on meeting the particular needs of women and girls,” says Marie-Claude Bibeau, Minister for International Development. “I have seen first-hand what our support for humanitarian partners can do for those in affected communities, who need it most. ”Through the Myanmar Crisis Relief Fund, donations to registered charities working to respond to the needs of Rohingya refugees between October 31 and November 28, 2017, were matched on a 1:1 basis by the Government of Canada. 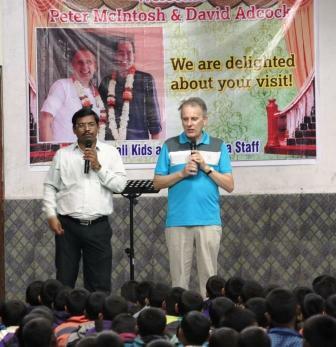 “We are particularly thankful to have such an experienced partner as the Pentecostal Assemblies of Bangladesh,” says CEO of ERDO, David Adcock. Through the Canadian Foodgrains Bank, ERDO and World Renew, with the financial support of the Government of Canada and other Foodgrains Bank members, is distributing $1 million of food to Rohingya refugees in Bangladesh. Aurpita lives in Kanchan, District: Nagaon, and she is 5 years old. Both her father Alib and her mother Sharmila work as day labourers. She has a younger brother named Avijit who is 6 months old. Aurpita’s parents didn’t receive formal education although her father Alib is literate and her mother Sharmila is learning from Aurpita. The family is landless and rents their traditional small bamboo & reed walled home. 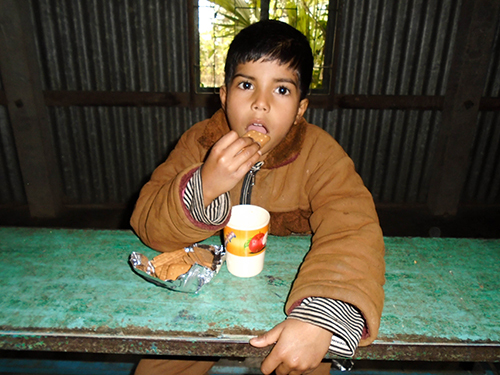 To help a child like Aurpita receive nutritious high-energy biscuits: donate now. Working alongside the ERDO team these past 10 weeks as the International Programs Assistant has been incredibly uplifting. I have had the opportunity to witness the impact of the Christ-like compassion in the hearts of the ERDO team. 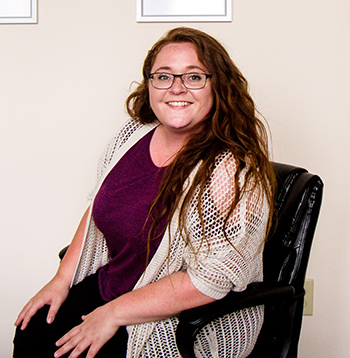 In a warm and encouraging environment, ERDO staff work hard to ensure the programs being implemented are sustainable and effective to create lasting self-sufficient change. In our North American society, it is so easy to disregard the lack of basic human rights and devastation plaguing developing countries. I had the chance to research the global water crisis this summer and was so disheartened to learn about the lack of hygienic sanitation worldwide along with the desolation it brings. This experience has truly opened my eyes to the sanitation issue and the importance of Christian humanitarian work. I am honoured to have been given the chance to work with the ERDO team. This genuine and kind-hearted group of individuals live out the ERDO mission and truly seek to honour God through their behaviour. Shilina Muring is a single mother who lives in Naogaon, Bangladesh. Her husband died three years ago and she could no longer afford to pay rent in her one room house, which led her and her two children to a very small village of 21 families in Naogaon. The village had no clean water. The women and their families risked waterborne diseases, insect borne diseases and skin irritation from the dirty water. Shilina’s son suffered from constant painful rashes and she worried that she would need medicine which she could not afford. 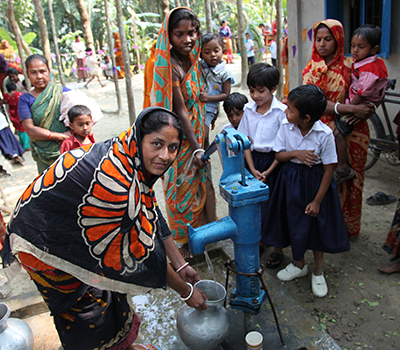 Through generous support, ERDO with The Pentecostal Assemblies of Bangladesh provided a brand new deep tube well along with community education on water and hygiene to the village where Shilina and her children live. Dusabe is a Hardworking Woman Full of Hope and Courage! 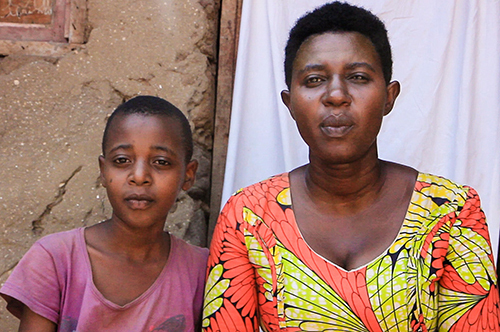 Dusabe is a single mother of three children who lives in in Gasenyi, Burundi. She is hardworking, hopeful, and courageous, and has owned her own business since she was seventeen. 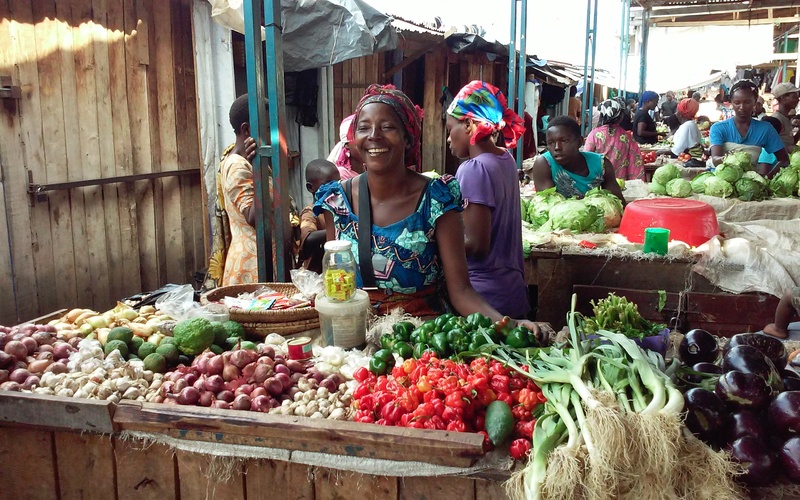 Things were difficult for her for many years, however, as Dusabe could not make enough money to sustain her business or fully provide for her family. 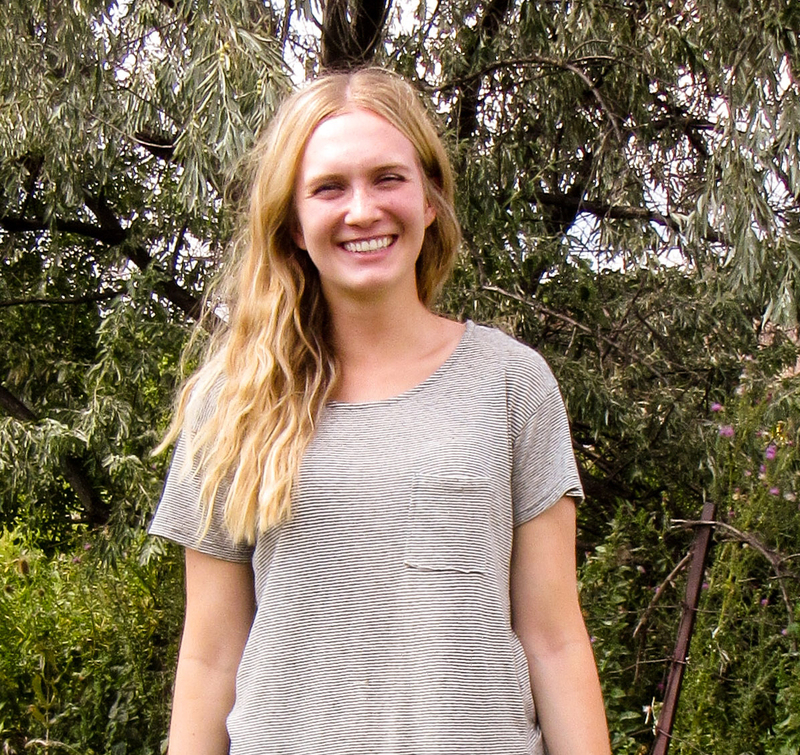 One day, God opened a door for her in an unexpected way: ERDO’s Wezesha Project. The Wezesha Project offered her microfinance loans and equipped her to expand her business. Before Dusabe joined Wezesha, she sold her wares of soap and salt on the street, but knew that it was an unsafe situation. 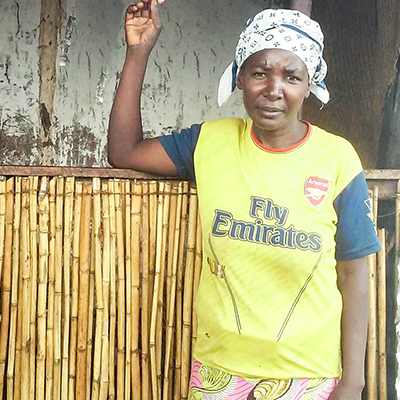 With her loans from Wezesha, she was able to rent a much safer place in the market. However, just as her business was beginning to grow, the situation took another difficult turn. Dusabe was poisoned, and spent a month bedridden and unable to work. Yet, even as her product began to spoil, she knew that God was on her side, and remained hopeful. Dusabe has now recovered, and is running a sustainable and growing business. She has been involved with Wezesha for a year and a half, and is now on her fifth loan. 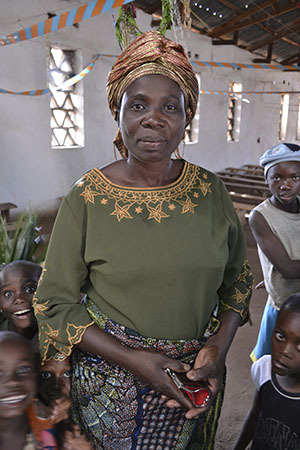 Through this provision, she can provide her children with an improved education. She has even been able to buy a plot of land on which to build a house! She is constantly improving and growing, and has many plans for the future. Her life has been transformed! 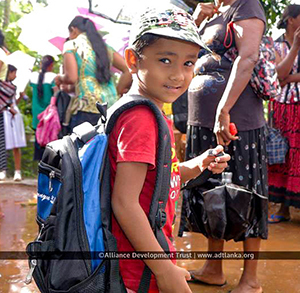 Children in Sri Lanka affected by the flooding and mudslides, received backpacks filled with school supplies because of your generosity. 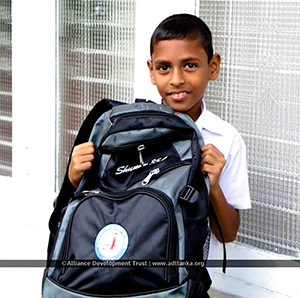 Altogether, we provided 200 school packs to children in 32 schools! On Sunday, May 21, All-Africa Council of Churches, together with World Council of Churches is calling on all Christians and churches in Canada to join the Global Day of Prayer to End Famine. The food crisis across parts of the Horn of Africa has worsened, expanding to a larger geographical area and impacting more people. The result is that there are more people facing famine in the world today than at any other time in modern history. We are calling on our churches and ministry partners to pray for the 20 million people across South Sudan, Yemen, Nigeria and Somalia currently suffering from severe hunger, and in some cases, famine. There is great danger that on its current course, the global response to this crisis will be hugely inadequate and will lead to unimaginable suffering and death, which can still be averted with timely intervention. We believe that our churches have a prophetic role in mobilizing their members, wider society and governments, and making a difference during this unprecedented period of suffering. As a congregational leader, would you take time during your service(s) on May 21 to pray for Africa—for those suffering and for those efforts being mounted by the church to respond to this desperate need? In our case our partners include our sister national fellowships Pentecostal Assemblies of God Uganda (PAGU) and Christ Is The Answer Ministries (CITAM). I recognize that May 21 is a long weekend, but there is great value in standing together with other churches around the world at that time. As you pray, you may wish to share a real live story about a family who has been severely impacted by this crisis (click here). The generous financial response to the famine from our churches has been encouraging, and we are trusting God now for a tangible breakthrough as we add intentional prayer to our efforts. It was as we gathered with pastors from across our fellowship at our General Conference in Montreal that we heard the breaking news of the Fort McMurray wildfires. 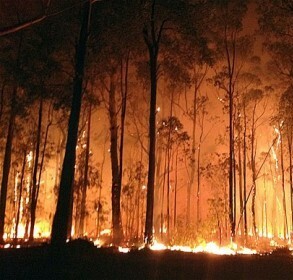 We together, watched in disbelief as the fire spread across the community. Homes and buildings were ruined; people were displaced – it became one of the biggest disasters in Canadian history. It’s hard to believe that a whole year has passed since the tragedy. I had an opportunity to visit Fort McMurray a few months ago and was struck by the stories I heard, and how the reputation of faith has increased in the community. The impact on families has been profound. Crises tend to reveal relational fault lines; they don’t create them. When speaking to Pastor Edwin Rideout, lead pastor of Family Christian Centre, he commented, “the wildfires seemed to be a turning point in people’s lives.” With this one crisis, I heard how marriages were strengthened. A couple on the verge of separation and divorce realized how important they were to one another and made a profound decision to stay together. The fire for many, highlighted the importance of family life and being together. As a result, this past Christmas, the Family Christian Centre did not have many events as previous years. They had family events. Children especially, did not want to be separated from their parents. Not only were families strengthened, relationships within the community were strengthened as well. As I have often witnessed in international disasters, crises foster community and cuts across occupational, religious and cultural divides. Lampposts in the community read “Stronger Together or “Safe Resilient Together.” Firefighters took an almost personal stance against the wildfire and determined that no public building, school, hospital or church would be lost. People went out of their way to help their neighbours. One of the last people out of the Beacon Hill community of Fort McMurray was an elderly couple that had Alzheimer’s and were house bound. They left their house and were on the street, but were given a ride by a passing neighbour and were the last car out of the community. “People woke up to see what their real purpose was in life,” said Donna, a resident of Fort McMurray who lost everything in the wildfires, “I now rather give than want to receive.” Donna and her husband David were visiting their daughter in town when they realized what was going on back home. They rushed home to try and get their stuff, however the police wouldn’t let them back in. After five weeks of not being able to return home, the couple discovered that they lost everything. “Workers make good money in Fort McMurray and everyone has a lot of stuff,” said David. It was then the couple realized that “stuff” is not as important as life. 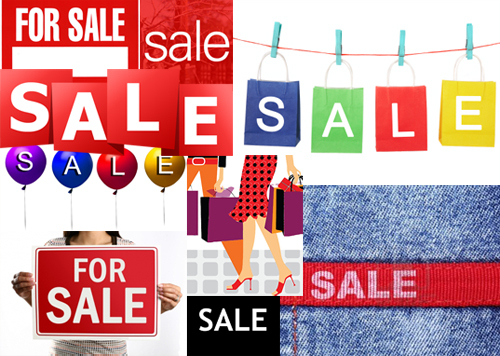 “Every time I buy something, I think now, do I really need it? The more stuff I buy; the more stuff I could lose,” said Donna. Donna and David were among those assisted by Family Christian Centre and ERDO. The response of our PAOC fellowship was rapid and generous. ERDO partnered with Family Christian Centre and assisted approximately 4,000 victims with counselling services, housing placements and gift cards to purchase food, clothing and hygiene items. Family Christian Centre, with assistance from North Pointe Community Church in Edmonton supported victims of the fire get the help they needed in Edmonton. Once the victims returned back to Fort McMurray, in addition to the partnership with Family Christian Centre, ERDO partnered with McMurray Gospel Assembly, North Life Fellowship Baptist, Fort City Alliance and All Saints Anglican to provide critical funding to families. Although it has been a year since the wildfires, the people of Fort McMurray are still rebuilding; not only their homes but their shared life. As I walked through the Abasand and Beacon Hill communities, I saw the capriciousness of the wildfire, treetops were unscathed but on closer examination, trunks were charred. On building sites, there were ugly gaps where homes once stood right next to homes left intact. Community leaders estimate that about 20% of the population have not returned back to Fort McMurray. For some, the wildfire was the catalyst to leave the community, many were taxi drivers, cleaners or child care providers, who did not have permanent employment and were hourly paid. The closing of the community meant loss of jobs and these workers have now built lives in Edmonton or in others parts of Alberta. This also impacted church life, Pastor Edwin reports that initially church attendance was significantly lower, however, twelve months later, attendance is increased with new people coming to church for the first time and encountering Christ in profound ways. -David Adcock, ERDO’s Chief Executive Officer. My name is Esheka. I am 20 years old turning 21 on the 19th of December 2017. I first came under the care of VOH Zimbabwe on the 9th of July 2008. I was doing grade 6. I am the first born in a family of 3 girls and we all live at the Village of Hope. Before coming under the care of VOH, I used to live with both my parents and siblings. My mother, however passed away and we remained staying with our father. We attended school at Louis Mountbatten Primary School where our father was working as a caretaker. We also lived on the school grounds. My dad then passed away on the 30th of April 2008. I was 11 years old at the time and my sisters were 8 and 3 years old respectively. During the sickness of my parents, none of our relatives visited or offered any moral support. When our dad died, the situation worsened. There was no one to pay for our school fees and upkeep since the uncle that we were staying with was financially challenged also. The staff at the school and children contributed towards our upkeep and schooling. The school authorities eventually reported our plight to Child Line who took up the case with the department of Social Services and a place was found for us at VOH Zimbabwe. We were placed at Kadesh house at VOH with mother Regina who is truly a blessing to us and has helped shape me to be the kind of a young lady that I am today. We started attending school at CHAPS on the grounds of Village of Hope together with my 8-year-old sister at the time. I was placed in grade 6. Academically speaking, I faced challenges when I was at Mountbatten and did not perform very well. However, coming to school at VOH was a Godsend, as the teachers at the school took their time to support and encourage me. Soon, confidence was built in me and in 2009 when I sat for my grade 7 national examinations, I came out with very good results. In 2010, I proceeded to do grade 8 at CHASS on the grounds of Village of Hope. Secondary school saw me excelling in my academics as I scooped prizes right from grade 8 up to grade 11. In 2013, I wrote my grade 11 national examinations and I passed all the subjects that I wrote with very good passes. Since the school on the grounds of VOH does not yet offer grade 12 and 13, I proceeded to do my grade 12 and 13 in 2014 and 2015 respectively at Mabelreign Girls’ High School. Again I excelled in my academics. I did 3 subjects, Accounting, Business Studies and Economics. In grade 13, I scooped merit awards in accounting and business studies. In 2015, I sat for my grade 13 national examinations and I did very well. I scooped a total of 13 points out of 15 points. Currently, I am enrolled at the University of Zimbabwe in the faculty of Commerce specialising in Accounting. I enrolled in 2016. It takes four years in university to attain an Honours Degree in Accounting. I thank God for VOH, for I know without their support, I would never have gone this far. Besides helping me academically, VOH has also played an important part in my spiritual life. I came to know the Lord as my personal Saviour and grew in Him through chapel services, Sunday church services and the devotions that we do at home with our housemother who is truly a mother. For me and my siblings, VOH is home to us and we are grateful to have a home that has also given us eternal hope. God is truly at work in our lives and has also blessed my younger sister academically. She wrote her grade 11 national examinations in 2016 and she passed. She is currently in grade 13. My youngest sibling is in grade 6. At one point in our lives, we thought all hope had gone, but thanks be to God who raised you VOH to be his arm of help in our time of need. God bless you. On April 25, 2015, a 7.8 magnitude earthquake struck Nepal and killed 8,800 people, injured an additional 22,200 people, and millions were left homeless. Thanks to the generous support of donors, ERDO was able to respond quickly to the emergency needs of families in the weeks and months immediately following the natural disaster through three key partners in the region: GEMS India, Assemblies of God Nepal and Pentecostal Assemblies of Bangladesh (PAOB). •provided basic emergency food and non-food items, including rice, oil, solar lights, medicine, and plastic sheets, in 20 villages to 6,415 people. •distributed basic food items and non-food items, including rice, oil, salt, blankets, and tarpaulin sheets, to 1,379 families across 6 regions of Nepal. 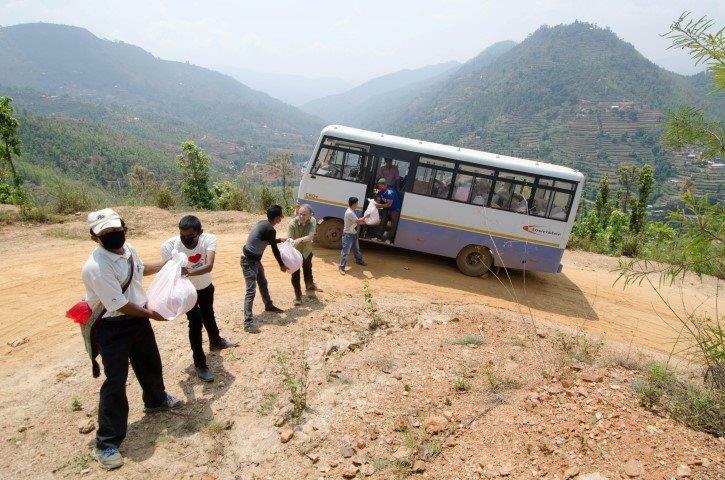 •provided food and medicine for 3,000 individuals in two districts in Nepal in the month following the earthquake. •provided temporary shelter to 388 families (1,940 individuals) in multiple villages in the Sindhupalchowk District in Nepal. Temporary shelters were constructed to protect families against weather conditions in the rainy season, following the earthquake. •supported the distribution of school and hygiene kits to 400 students, as well as classroom supplies and sports equipment to a school in Central Nepal, which was greatly affected by the earthquake. 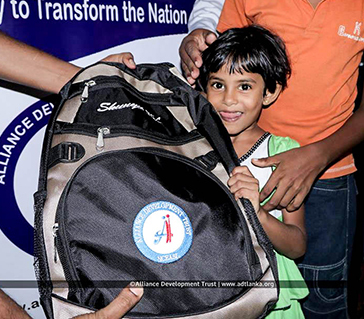 The supplies provided for immediate needs to assist in the critical development of children through education. Currently, two years after the earthquake, ERDO is contributing to the recovery stage after the disaster through an important housing project. •providing loans for 24 families (168 individuals) to build earthquake resistant homes. The families will pay back the loan over a maximum period of ten years, and will volunteer to help other families build their homes within the community. When loans are repaid, additional homes will be built. 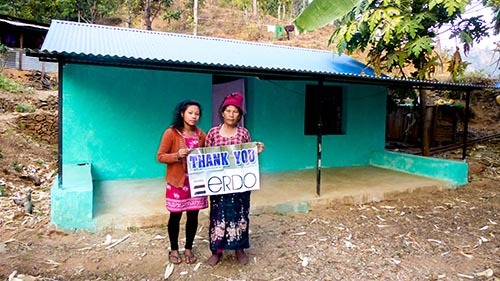 Through the generous support of ERDO donors, nearly $400,000 to-date has been provided for critical crisis response assistance to Nepalese families following the April 2015 earthquake. Donations to these programs in Nepal not only met immediate needs, but also continue to empower individuals and families in their long-term recovery as they work to rebuild their lives in the quake of disaster. "I thank the Wezesha programme for their support." My name is Ndayisaba Marie and I live in Kinama. I have five children; three are my own and two are orphans that I am raising in my family. I am a widow and I live with my mother-in-law. Before I met Wezesha, I was trying to support my family with a small business selling vegetables by the side of the road. But I did not have much capital, and it was hard. Some days I got no profit. When I did, I would spend it straight away on new clothes or fellowship with my neighbours. Someone from Wezesha came to the street where I was selling vegetables. They told us about the programme, at first we thought it was a scam, and they were cheating us. But they told us to register in groups of 5 women, and came to visit me at my house and then 2 weeks later, phoned to invite me to come for training. I found that it was a serious project, and they were not trying to cheat me, but would really lend me money for capital. During the training, they taught us how to run a sustainable business; not to spend all the profit, but how to save and invest as well as provide for my family. They also taught us how to expand our business and look for other opportunities. The training and the new ideas have really helped me to improve my business. With the first loan I was able to rent a table space in the market, rather than by the side of the road (this was important because the police chased people who do not have an official place to sell) and I increased the stock in my existing business. With the extra profit and the second loan, I also bought a goat. This goat had three kids which gave me more income. With the third loan I expanded my business with new items of stock that I didn’t sell before. Before I just sold tomatoes. Now I sell all the ingredients that go together with tomatoes to make a sauce. This means customers don’t need to go somewhere else. Now I am in the 4th loan. I have been able to open a small shop in Kinama market. In the future I want to get products from nearby countries to sell and expand my business further. I opened my own bank account, and I am saving for my children’s school fees in the future. Before, I was desperate, I was afraid that I would not find the money to pay for my children’s education. Now I have no fear. Before, my mother-in-law would ask me for things, like special food suitable for older people, and I couldn’t pay for it. My children would ask for clothes and I couldn’t afford it. Now I can. I thank the Wezesha programme for their support. I don’t know where I would be without Wezesha. I hope they keep on empowering other women, because there are many who are still struggling to sell vegetables on the street like I was. About five years ago, my husband and I received an amazing gift from my brother and sister-in-law at Christmas. 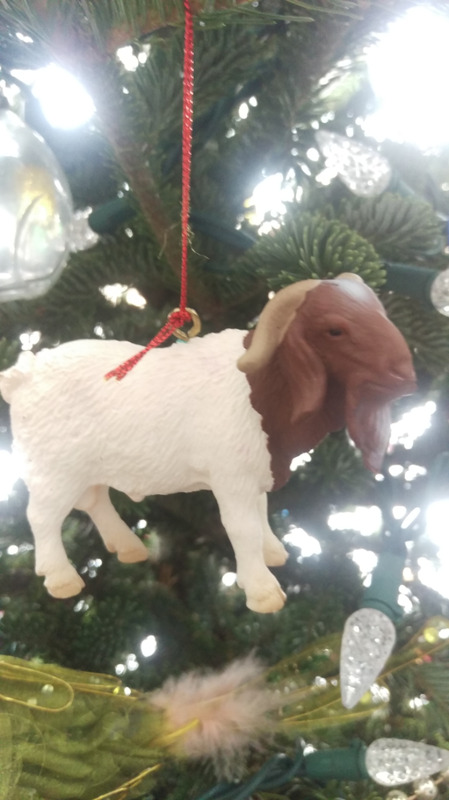 It was a small acrylic ‘goat’ Christmas tree ornament! A very realistic looking goat on a small string. They explained the meaning of the goat and how it represented the monetary gifts they had donated to a particular charity that year, on our behalf! A family somewhere in the world, will now have milk and cheese to feed their family and others in their impoverished village, where water is scarce and disease is rampant. It brought tears to my eyes as they explained how this all worked. When my husband and I arrived back home that night, we hung our little goat on our Christmas tree and somehow, I felt like I had participated in doing something big, bigger than me, bigger than my stack of gifts under the tree. A little goat staring back at me just made my heart melt as I reflected on their words and what this meant. We asked them to make THIS the only kind of gift that they would ever give us again for Christmas! Since then, we have received many Christmas tree ornaments representing the various critical needs; a small glass jar with a spoon on a string, representing water, then we received a woven cross representing bibles and church support in a community, then a figurine of a man with tools in his hand representing labor help to build homes, and last year a woven fabric chicken representing the chickens purchased for eggs and meat. These gifts might seem insignificant or strange if you received them on their own. Someone might look at it and think its cheap or useless, but for the people who receive the donation it’s very valuable, life-saving and life changing to them. The little gift we see on our tree, represents an ETERNAL precious gift that God has given to us, to give to others. 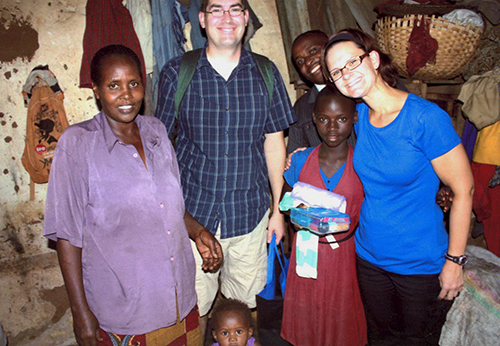 Back in 2004, my husband and I began sponsoring children in Ethiopia through the ERDO program; ChildCARE Plus. 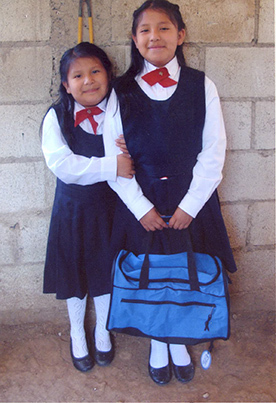 Our two oldest girls have now graduated from school and out of the program, healthy and safe! The four younger ones are still with the program receiving medical help, education, food and resources. ERDO stands for Emergency Relief and Development Overseas. So because of Christian based missionary groups being funded to go out to these less fortunate people, and share food, farming practices, water sourcing and filter-systems, these precious children and their families have a better chance of survival and quality of life. They are given bibles in their own language and resources to build churches and set up emergency relief for people in need. My husband and I were so happy to learn that ERDO offers similar Christmas charity gifts and opportunities like the charity that my brother and sister-in-law support. So this Christmas, we are now sharing this gift with you. Now eight families will receive goats and fowl for Christmas 2016! We hope this touches your heart like it did for us. We all are so blessed to be sure of our next meal, clean water to drink, comfort and security in our homes and surroundings with modern conveniences. When we are needing something, by the grace of God, we all have an income and resources available to us in this country. “...Do not store up for yourselves treasures on earth, where moth and rust destroy, and where thieves break in and steal. But store up for yourselves treasures in heaven, where neither moth nor rust destroys, and where thieves do not break in or steal; for where your treasure is, there your heart will be also. 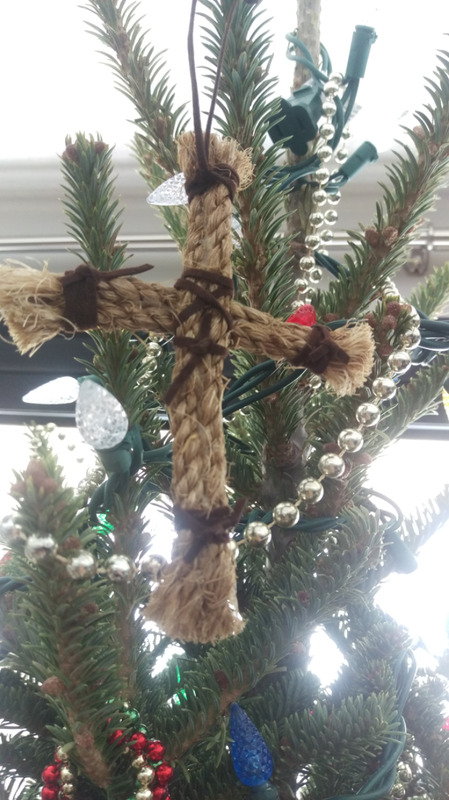 We are so grateful for the time, health, and resources available to us, but we are reflecting on what Christmas has become and hope this letter explains and expresses our heart. We love you and wish you all a Merry Christmas and may God richly bless you and your family this Christmas 2016! To learn more about ERDO’s Christmas Gift catalogue or to purchase a gift that makes a difference, visit: www.erdo.ca/giftcatalogue. 760 Reasons to Say Thank You!! On Tuesday, November 29th, ERDO participated in Giving Tuesday for the first time – a global movement where people around the world join together and give to non-profit organizations. 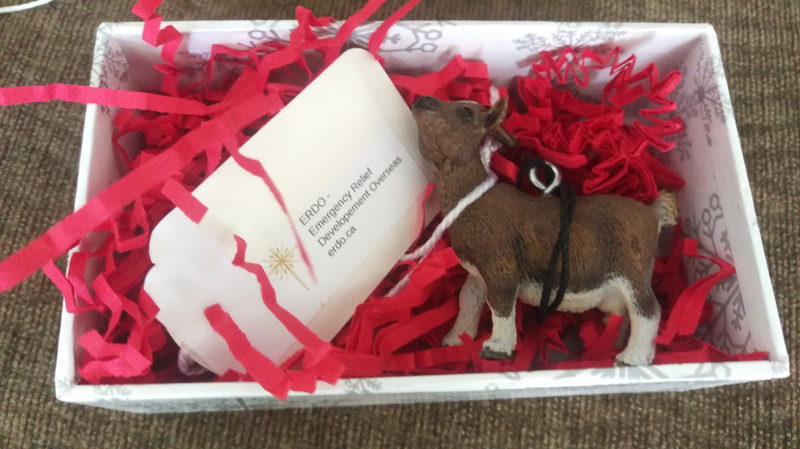 ERDO set out a goal to raise funds to provide 100 goats to widows in Kenya and through the generous donations of our supporters, we are happy to report that we surpassed our goal and raised funds to provide 760 goats to widows in Kenya! Thank you to all those who supported us in surpassing our goal. Your generous gift will allow widows in Kenya to have access to a reliable food source and generate income for their families. We are overwhelmed by the response we received and we want to thank all of you for joining us in our mission to do good! "I want to try that!" Nataliya was abandoned by her parents at birth and grew up in the Orphanage for Children with Disabilities in Dnepropetrovsk, Ukraine. The people who lived around the orphanage called it, “The place that God forgot”. However, God led a few Canadians to that very orphanage in order to show the people of Ukraine that He never forgets anyone. ERDO’s ChildCARE Plus (CCP) program in the Ukraine began in 1998, and helps underprivileged children from Kyrgyzstan, Krivoy Rog and Dnepropetrovsk who are living in orphanages. Children with severe disabilities are marginalized and ‘given’ to the state by their parents when they are born. These children are left feeling unwanted and have little hope for their future. The CCP program strives to help each child understand that God loves them deeply and has a unique plan for their lives. Hurricane Matthew is the most powerful Caribbean storm in almost a decade. Hundreds of people have been reported dead - homes, bridges and farmlands have been destroyed, leaving many children and families in difficult situations. Southern Haiti was the hardest-hit region in the country and Port-au-Prince experienced the tail end of the storm which resulted in heavy rains in the area. We have been monitoring the situation and staying in touch with our CCP field administrators and program partners and we are grateful to know that all of our children in the ChildCARE Plus program are unharmed and all of our projects in Haiti are intact. 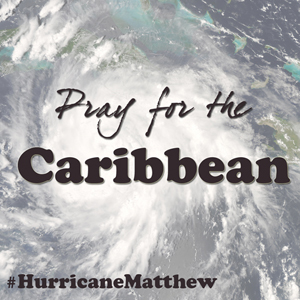 Please join us as we pray for the safety of all those who have been affected by Hurricane Matthew. May the Lord watch over them and protect them during this time. Being a parent involves tough choices. Sometimes, the correct answer isn’t obvious, or you’re faced with a daunting and unpopular decision. But what if you had to choose between medicine for your sick child or feeding the rest of your family? What if sending your child to school, their only chance for a better life, meant the whole family went hungry? What parent could face those kinds of choices? In the area of Kenya where Akililu Hunqe grew up, his family and many in his community face those choices every day. In his community in Northern Kenya, the land was parched, and dry season lasted most of the year. No crops would grow, so the people were pastoralists, and their livestock was the mainstay of the economy. They lived in houses with mud walls and floors and a tin roof, and they carried their water from the community well several times a day. 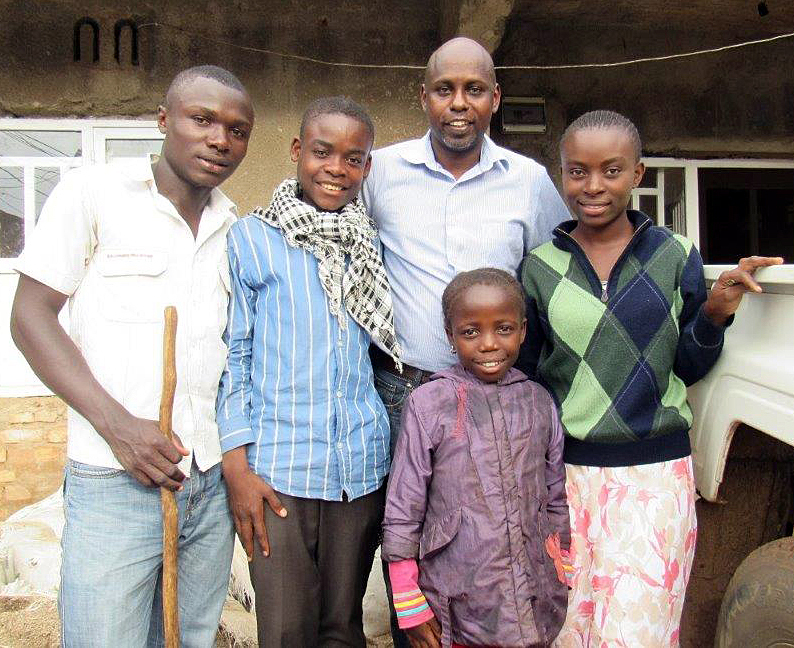 It was a difficult life by our standards, but for Akililu and his five siblings, it was the only life they knew. 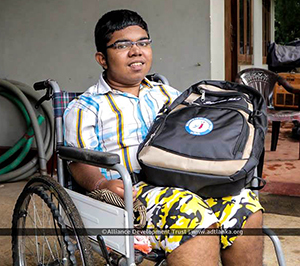 He attended the local elementary school, and although he was exceptionally bright, there was little hope of him getting more education because his family had no money. One of his earliest memories is pushing a wheelbarrow with his mother. An agency provided food relief and they walked to get their share. He remembers celebrating when they brought the food home. “Every day is a choice, whether to feed your family, send the kids to school or get medicine for a sick child,” says Akililu. Then came the day when everything changed. 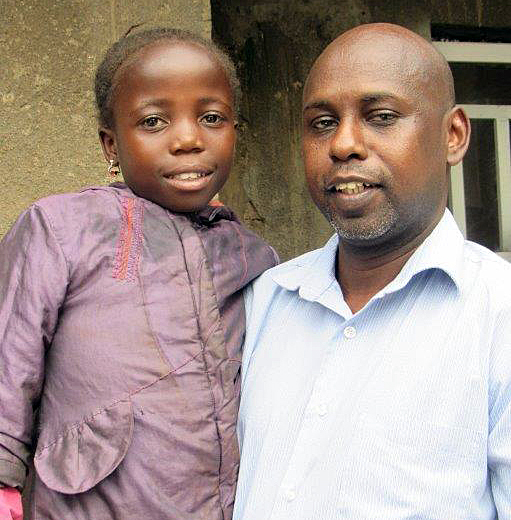 As the oldest child in the family, Akililu was chosen to be a sponsored child with an aid agency. It meant he had food, and could get medicine if he was sick. For his family, it meant at least one child was looked after, so there was more for the rest. Akililu completed elementary school. There are few good quality schools in Kenya, but as a top student, he was accepted into a national school. However, accepted meant he was invited to go, but it didn’t pay his tuition. His family could never have afforded it, but a British local church missionary in his community paid it in full, including his schooling all through college. Akililu was blessed to meet this man’s son a few years ago, and was able to express his gratitude. High schools in Kenya are residential, and getting there meant two days’ travel on the back of trucks carrying livestock to markets in Nairobi. As a young boy, leaving his family and travelling to the city was frightening. He’d never been beyond his rural community. In spite of the challenges, he thrived. He loved to learn, and food was plentiful. After high school, he returned to Northern Kenya and worked with an aid agency in a community similar to his. He studied the Scriptures and was enthralled by the link between physical poverty and spiritual poverty. He longed to study further. His opportunity came when he attended Pan African Christian College (now University) and graduated with a Bachelor of Arts in Theology. 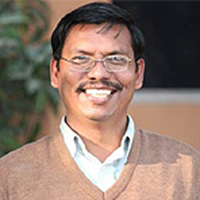 Armed with new understanding, he returned to his community and joined a mission agency involved in church planting. They worked with young people and others to mobilize teams and evangelistic outreaches. The hunger to learn and apply his faith led him to the University of Nairobi where he received a Bachelor’s degree in 2002 and a Master’s Degree in sociology in 2005. The second degree specialized in rural sociology and community development. Since then, he has poured his life into service. While working in Kenya, he led a national program targeting youth and promoting abstinence to combat the spread of HIV/AIDS. With another organization, he coordinated relief efforts in Somalia, a country that is 99 percent Islamic. He has also provided leadership to several agencies, including Canadian Foodgrains Bank, as they offer emergency response and ongoing programs to address world hunger and poverty. Does child sponsorship make a difference? Akililu says, “Sometimes people don’t see how $37 a month makes a difference in the life of a sponsored child. It means children don’t have to leave school and work alongside their parents so that the family can eat. It’s a lifesaver. It definitely made a difference in my life, and that’s why I’m doing what I do. I look at my life and see the opportunities that have been provided for me and the generosity of people I don’t know, who gave so that I could have my needs met and go to school. I see this as God equipping me and providing me with a perspective that is different.” Akililu sees sponsorship from both sides, and understands the value of those gifts in a way few can. This is a reminder of the story of a man walking along the shore, throwing starfish into the water. When asked why he bothered to save a few when there were thousands he couldn’t save, he threw another into the water and said, “I made a difference for that one.” The needs are overwhelming. It’s tempting to walk away and think it isn’t possible to make a difference. Akililu’s life proves, not only does sponsoring a child make a difference, but that the ripple effect is experienced far beyond the original sponsorship. This article was written by Ann Peachman Stewart and first appeared in the September/October issue of testimony magazine. I had the incredible opportunity to work as a summer student for the ERDO International Programs team. Over the past 8 weeks, I have seen the important work that ERDO staff do in the background that makes the work that ERDO partners do in the field possible. The Bible consistently speaks about the responsibility that we as Christians have to demonstrate our love for God through showing love to the poor. James 1:27, “Religion that God our Father accepts as pure and faultless is this: to look after orphans and widows in their distress and to keep oneself from being polluted by the word.” 1 John 3:17 says, “But if anyone has the world’s goods and sees his brother in need, yet closes his heart against him, how does God’s love abide in Him?” Day after day, I have watched the ERDO staff put these verses into practice, and serve in the least glorious ways in order to serve ERDO’s program partners, and by extension, the 150,000 people that ERDO’s projects reach every year. I was so privileged to be a part of this incredible team and the work that ERDO does, even if it was for a short while. Over the course of the summer, I have seen ERDO’s commitment to producing quality programming overseas. As a recent graduate of Wilfrid Laurier University’s Global Studies program, I have taken multiple courses on the theory and practice of international development and crisis response. I truly appreciated being able to see good development and crisis response principles in action in this organization, as well as the commitment that ERDO has to excellence in all areas of programming. Overall, I am extremely thankful for the summer I spent working at ERDO. It is hard to even put into words all that I have learned over the course of the summer. I have not only learned a lot about community development and crisis response in practice, but I have been so motivated and inspired by the dedication that the ERDO staff have to providing the best possible programming throughout all of ERDO’s projects. This culture of servanthood and commitment to excellence starts with the leadership team of the organization, and is so evident in each and every staff member. I have been blessed to be a part of what ERDO has done, and I am excited to see the good work that ERDO will continue to do! Meet Andreia, Ademar, and Ademiro, three siblings who were brought to the Home of the Good Shepherd, a vocational and residential school, after being abandoned and neglected by their mother and abused by their father. The three children were removed by Child and Family Services after they experienced horrific abuse at the hands of their family. At age 15, prior to coming to the Home of the Good Shepherd, Andreia became pregnant and had to learn the challenges of motherhood at a young age. These children came to the home with much hardship and hurts, but the Lord has worked tremendously in their lives to turn things around! Ademar lived at the home for four years and has since graduated and is now serving in the military. He is serving the Lord in his new life and was baptized last year! 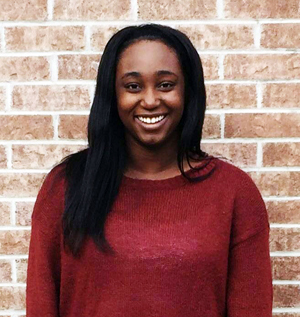 Andreia too has been thriving in the loving Godly environment at the home, and is attending high school and doing esthetics training. She is one of the first students to be introduced to the new Integration Program, where she is learning to be self-sufficient and to properly care for her three-year old daughter Evillin. The youngest of the three children, Ademiro, is still living at the home and is going to school full-time. He was also baptized, and continues to work hard and strive for the things of God. Thanks to ChildCARE Plus sponsors, these children are able to experience the transformative power of God’s love. 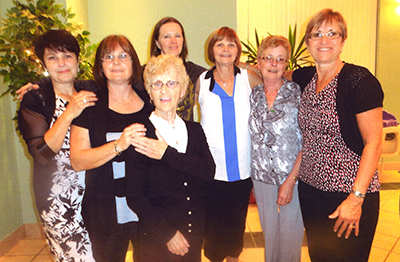 Through ChildCARE Plus, ERDO has assisted the Home of the Good Shepherd for many years. Learn more about sponsoring a child in Brazil, or any other country in need. I just spent a few days in Northern Bangladesh visiting schools that operate our In School Feeding programs. This initiative is very important. Children may not feel hungry, as there are potato and rice fields all around, but access to vital nutrients for young children is so limited in this remote rural area. I was struck by the welcome and the strong sense of community in villages. Most families are eligible for the program as most of them are in same situation. I was surprised that I didn't see any toys in any villages we visited. Not one! I saw that a few boys fashioned a cricket bat and were playing but not with a toy. Children were happy nonetheless. And children here are first, just "children", before they are "poor children". They ran, were loud and didn't sit when they were told; in other words put 40 under 8 year old children in a room and they lived up to their job descriptions as children. I had a lot of fun just hanging out with them. ERDO was privileged to work with Cheryl Ann over the period of several years. 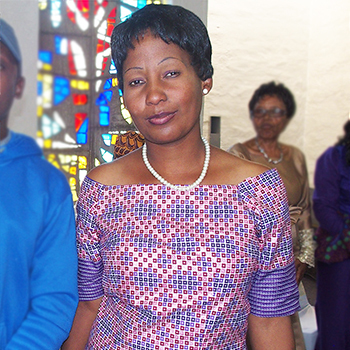 She was a major part of ERDO programming in Zambia from 2003 – 2015 and touched many lives with the love of Christ. Her work with ERDO was primarily focused on children and their families. 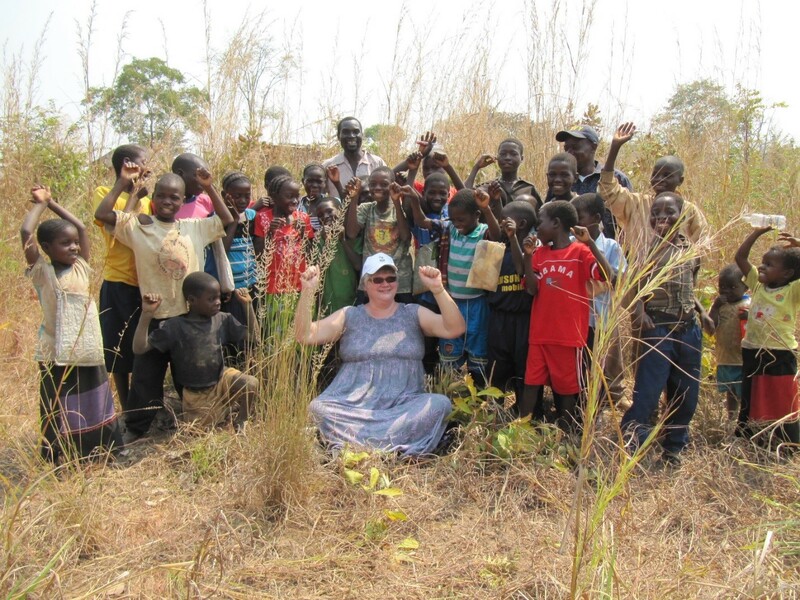 In 2003, during a time of serious drought in southern Africa, Cheryl Ann contacted ERDO to ask for help feeding the malnourished and ill children in the 14 schools she was working in… this lead to a 5 year In School Feeding Program for 2,583 children, and an 11 year working relationship with ERDO. Driving along the roads in Lundazi children would line up beside the road when they recognized her distinctive turquoise vehicle… singing “Thank you Cheryl, thank you for giving us food” she was much loved by the children and families she served. Despite the fact that Cheryl Ann had never worked with ERDO before she wanted to ensure that the In School Feeding Program was done well and that it met the many requirements and standards of a Canadian Government supported project through ERDO. So true to form, she learned and participated in all aspects of the program. The impact she made in the lives of these children was far more than nutritional; she was the hands of Jesus extended. Cheryl Ann also gave oversight to a 2 year Conservation Agriculture Program to help 2,000 families recover from the drought from 2006 - 2008. If she was challenged by the increased work required by this new type of program, she never faltered; continuing to give her best and becoming adept at Conservation Agriculture. Cheryl Ann also linked ERDO to the work of the national church through the provision of water wells to communities desperately in need of clean water and involvement in church led programs around Income Generation Activities for women widowed by HIV AIDS. 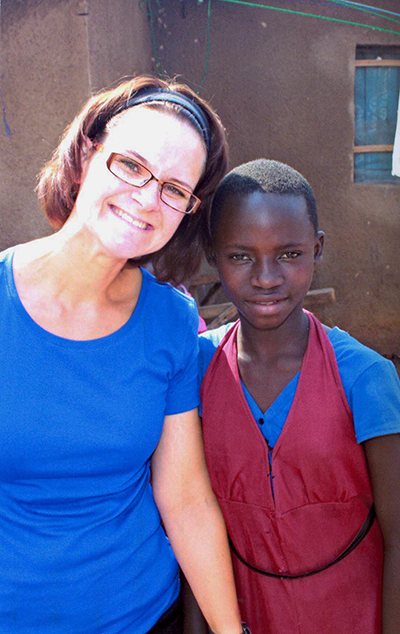 Right up until June of 2015 Cheryl Ann continued to connect with ERDO about one of ERDO’s ChildCARE Plus Sponsorship locations in Petauke, Zambia. An area where she implemented the program for children orphaned by HIV AIDS and taken in by local church families who could care for the children but could not afford to send them to school. As I’ve been visiting our programs in Africa for the past two weeks I caught just some of the refugee crisis news. I’m now back and have read some of the comments in the media, and those posted on ERDO’s Facebook page. Please allow me to share why we do what we do, and why we’re calling on Canadians to help. God's invitation is for us to extend ourselves and welcome those who are outcast. It seems to me that applies to the current trauma faced by millions who have been cast out from all they know and love. Isn't home a place where you belong? Scriptures remind us to help people find home again. Isaiah says that as we do this we too are blessed. If Canada and Canadians help the millions on the refugee road, that will be a good and noble thing. I pray that in the middle of our own election, the plight of the poor won't be a political issue but something we all, as Canadians, can agree on. ERDO and The Pentecostal Assemblies of Canada (PAOC) have been helping in Syria, Northern Iraq and Lebanon for the past two years. We are following the call of Christ to work for Him in the world’s most distressing places. I am so glad that ERDO has been doing this with our PAOC church support, and will do more in the weeks to come. We will help Middle East churches reach out to all, regardless of faith. What is happening in Syria and the Middle East is not one faith against other faiths but extremists vs moderates. Jesus taught us how to respond in these situations in His parable of the Good Samaritan. "Ask who is our neighbour" Jesus doesn't give a definition of neighbour. He simply says our neighbour is someone whose need we see and whose need we can help. We shouldn't define our neighbour, we get to discover our neighbour. This is our moment, our time to follow Jesus into the complexity of the Middle East. Pray, give, be informed, ask others to get engaged - this is our call. One last thought. In Deuteronomy where God says "welcome the poor and alien into your midst”, the right translation there is "welcome YOUR poor". We are connected in a real way to the dispossessed. We belong to them and they belong to us. "As I return from a week in Nepal I'm amazed by the massive need across the middle of the country. I've seen whole villages in which every home was destroyed. I'm also encouraged by the generosity of Canadians and of the strength of the Nepalese who are working together, despite their pain, to rebuild lives, homes and their future. I know the global media may have moved its focus elsewhere, but for the people of Nepal it is still fresh. The second large earthquake and the aftershocks including the 4.4 one of yesterday in a sense, created a "new normal". A normal of fear and anxiety. Even people who have homes sleep outside because of this new normal. While I was there, I felt two minor aftershocks. It was unsettling and I felt it in my body for hours later. I can't imagine living like this every day! On May 19th, I spent the day in Central Nepal with our partner and we were the first people from the city who were able to get to a village. It took us three hours on a switchback road. At one point our van was so very heavy that we had to unload our supplies and carry them up the mountain for a kilometre and then reload and carry on up the difficult terrain. I sat yesterday with a young mother who lost her three year-old daughter. No golden answers came to me, I just sat with her for a while, knowing that even if I knew Nepalese, I still didn't have words to erase the pain. I will pray for her in the months to come, that somehow her heart would begin to find peace. I'm so thankful for everyone who has given to Nepal. With these funds ERDO fed over 3,000 people every day in Katmandu over the two weeks after the quake and now is distributing emergency relief kits to nearly 3,000 villagers in the most remote and affected regions. Each kit is enough to feed a family for 30 days. What a honour it was for me to represent you and let the villages know they had friends in Canada. Thank you for your financial support and prayers for the nation of Nepal. To make a donation or additional gift to the relief efforts, please click here. "I’m at the end of an amazing day in Prem Sewa, a home for poor and disadvantaged children started over 25 years ago in Nagpur. I’m overwhelmed by the scope and depth of the boys’ school and home today, and the noise and joy of almost 600 boys in one place! While the morning shift was in school, boys from the afternoon school shift played soccer and to my British delight, cricket. I spent evening at chapel with boys. They sang with as much enthusiasm and again noise as you can imagine. They welcomed me to chapel and thankfully laughed at all of my jokes! Beyond the laughter, and singing, I listened to Grade 10 and 11 boys tell me about their dreams for the futures. The fact they were thinking about their futures with such hope and anticipation is so connected to the support received by each ChildCARE Plus (CCP) sponsor. I’m so delighted I get to be a part of that connection! One thing that shouldn't have surprised me, but did, was how CCP sponsored students talk about their long-time friendships with their sponsors. It’s clearly an impactful and meaningful relationship as the boys shared with me what details they knew about their sponsors’ lives in Canada, their families and their activities. They look forward to getting letters and photos so have asked me to please encourage their sponsors to keep them coming. As I reflect on this gift of a day I’ve been given in visiting Prem Sewa, I thank God for the vision to build the first boys home which housed 10 boys, and to Bapu Desai who is the current day Director of the boys and girls homes. Bapu has come full circle from being a student at Prem Sewa to now leading it into the future. David Adcock is currently in Chiang Mai, Northern Thailand and writes: "Spent the afternoon with high school students in our ChildCARE Plus program. What a thrill to listen to their dreams for their futures. So many of them encountered Christ through the program and led their parents to the church. Some of the Grade 11 students are heading towards careers in Early Childhood Education, others in the medical field...and even sound engineering. All have a future through and in large part ChildCARE Plus and their Canadian sponsors. What a joy just to listen to their stories and laughter today..."
"Just wanted to let you know how much the Moms appreciate receiving the Mosquito Nets for their children! I have included a photo of a child using his net at home. So far we have given out almost 400 of the nets and we are holding our Christmas Parties at the moment and handing out lots each day. Today and Friday we have the party for the kids coming from far away Mngwangwa and Nambuma as well as those from Kauma so we will be giving out lots more then." Thank you to everyone who gave through ERDO's gift catalogue last year, and for giving again in 2014. God bless you! Ever wonder if those gift catalogue items you purchase make a difference in the life of the recipient? We followed up on how the gifts of livestock are impacting widowed women in Northern Kenya and heard the amazing story of Waru. Read it here in the November/December issue of Testimony Magazine. 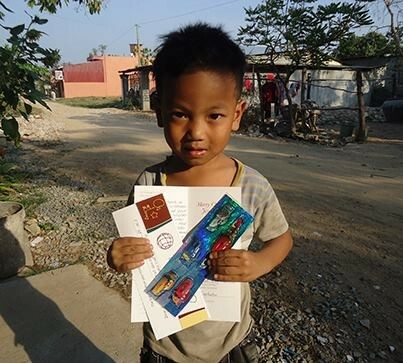 ChildCARE Plus sponsored child KimHout, pictured here, shows us his Christmas card and stickers that he received last year from his loving CCP sponsors. These special Christmas gifts are truly cherished by the thousands of sponsored children that receive them each year. It's fun to receive mail, especially mail from across the world. ERDO’s 2014 CCP Christmas campaign was mailed to sponsors earlier this fall, with hopes that sponsors would enjoy writing a special Christmas greeting to their special sponsored child. Thousands have already arrived back to our office, and lots more are arriving daily! Sponsors are also welcome to send monetary gifts to children at this time as well as include small, flat items that can fit inside the envelope such as stickers, hair clips, bookmarks, etc. We ask that sponsors send all cards and gift items to our ERDO Canadian Office; from there we are able to track correspondence and direct them where they need to go. Sponsored children love to receive these special notes filled with messages of love and hope, reminding them that they are special and loved deeply. 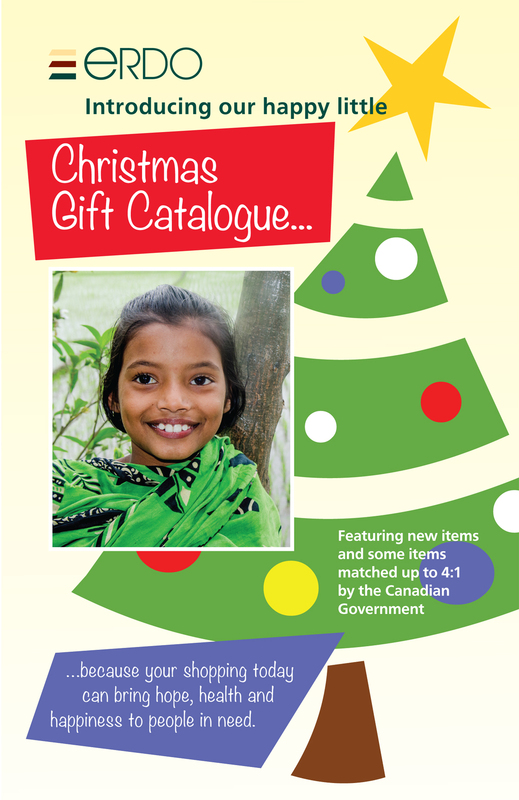 Help spread the love of God to your special CCP sponsored child this Christmas! Waiting for a Sponsor – Maybe it’s you? 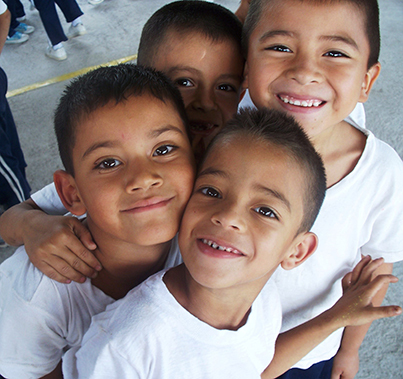 ChildCARE Plus, ERDO’s sponsorship program, currently has 7,200 children who are sponsored. That’s 7,200 children’s lives that are being impacted because of caring sponsors in Canada and other parts of the world! There are many other children who are waiting to be sponsored. 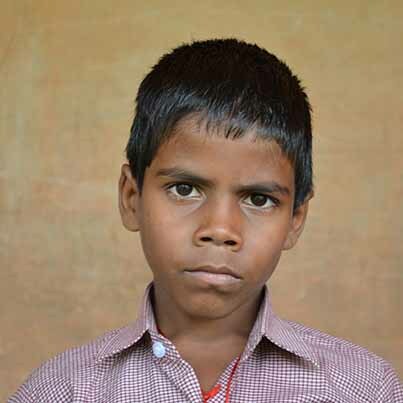 Sambhaji is waiting for a sponsor through ChildCARE Plus. 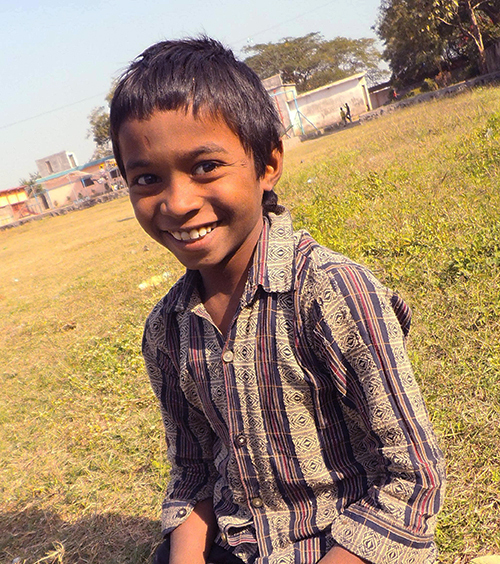 Sponsorship will allow him to attend school at the Boy’s Home in Nagpur, India. A continued education would open up more opportunities for his future. He is currently in grade 5. Would you consider sponsoring Sambhaji? Contact us at 1.800.779.7262 or by e-mail at info@erdo.ca to sponsor now. In October 2013 we asked for help for 3,000 families in Tshlotshlo, Zimbabwe who were suffering from a food shortage due to a poor harvest. Emergency food was needed to get them through the next five months until the next harvest time this coming April. With donations from our supporters and matched Canadian Government funding from our membership in the Canadian Foodgrains Bank, we have been able to help these families with emergency food. Food has reached the most vulnerable families. A total of 300 metric tons of maize, 60 metric tons and 30 metric tons of cooking oil were delivered to the communities in the last two months. The beneficiaries of this food assistance program are mainly grandmas caring for orphaned grandchildren and single mothers who are struggling to provide even one meal a day for their children. There are a large number of child headed households who are also being cared for by this program. Many families have testified of the goodness of God and how this food came just at the right time when even asking a neighbor would not be possible as everyone was in the same predicament. Thank you for your generous gifts that made this possible! This urgent food is truly lifesaving. There’s something about child sponsorship at ERDO that you may not know. 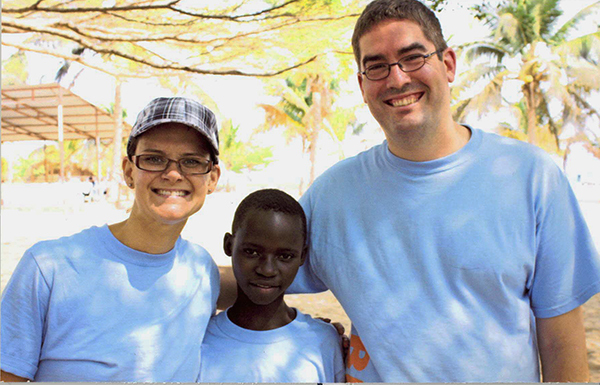 The majority of the ERDO staff sponsor children. Working for an organization who’s heart is “ to provide compassionate, practical assistance to strengthen people and communities in developing countries”, it follows that they would be touched by the needs of children (http://erdo.ca/mission-vision-milestones) . What was a surprise to many was how their gift became a gift to them. Children who benefit from ERDO’s ChildCARE Plus program not only have their lives changed today through receiving enough nutritious food, clean water and medical attention. Through the payment of school fees, uniforms where needed and school supplies, they are given the chance for an education. This is their opportunity for a future that doesn’t involve poverty. For many children, it changes the direction their families have taken for generations. Jennifer Johnston, ChildCARE Plus Administrator, had the unique opportunity to visit her sponsored child in Nairobi, Kenya. Read about her experience on the June 11th 2013 blog post on this blog. As the season for exchanging Christmas gifts draws near, perhaps you could consider a different approach. What if you gave each of your children or grandchildren a sponsorship of a child approximately their age? They could write the child and learn the realities of their situation. The impact could be life changing for everyone. Or perhaps you could challenge your workplace or your neighbours to sponsor a child together. Ann Peachman Stewart is a freelance author from Mississauga, ON, and a long time ERDO supporter. 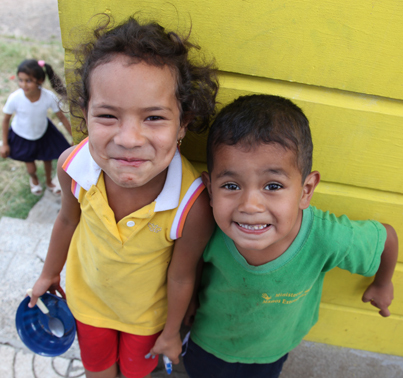 In three areas of Tegucigalpa, Honduras, 1,203 children from kindergarten to grade 6, and 300 preschool children are fed through our In-School Feeding Programs. Here are a few of the children’s stories. When our workers met Jason he was underweight and often falling asleep in school. Jason rarely smiled and was very quiet. Due to the feeding program, Jason’s weight and health have greatly improved. He is energetic and lively. His smile is beautiful! A third grade child named Karen was diagnosed with anemia and the doctors were concerned that she might have other serious health issues. In June, she started receiving our nutritional soya blend drink and she began to show physical improvements in a very short time. Karen’s latest medical checkup was good, with no problems identified. Mothers of the children who are a part of the program say they see improvements in their children’s health. Their boys and girls are more energetic and don’t fall asleep in class. The mothers also say that their children look forward to the daily food. They also acknowledge that the food their children receive is made with love. 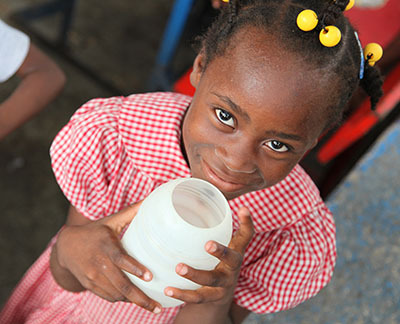 ERDO also has feeding programs in Haiti, Bangladesh and Zimbabwe. Thanks for feeding children and being part of the stories that we mentioned here. Earlier this fall Divine’s sponsors met her and were able to spend time with her while they were on a missions trip to the Village of Hope in Burundi. “We love having sponsored children. 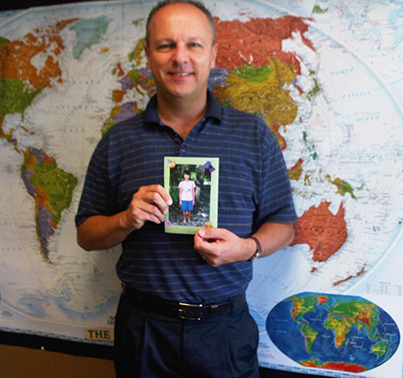 We decided to sponsor a child from Burundi because we knew we were heading there in 6 months for a missions trip. We feel God has blessed us and love the chance to give back to others and make a difference in the lives of that child and her family as well,” says Shane and Pam, Divine’s sponsors. They were grateful to not only be able to meet Divine but to spend a few days with her. They were able to visit her home and spend time with the rest of her family. “To see what she lives in daily is heartbreaking, but we’re thankful for the opportunity to support her, not only in monetary ways, but by also having a better idea in how to pray for her,” Shane and Pam said. “Because of our sponsorship Divine is able to go to school and have a supplied breakfast every morning. She is also a part of a community of sponsored children and the workers at Village of Hope. She knows that if she has trouble that someone there can help her, and she sees the older children succeed, going on to jobs or university and she can be encouraged by this,” says Shane and Pam. How much would you be giving if you gave 10 to 50% of your water bill for one month? That’s what members of Hay River Pentecostal Church did last summer. Hay River Pentecostal Church is a fairly small church in Hay River, NT with about 50 people attending. Size doesn’t dictate the amazing things this church has done this year (Check out our previous blog post about some of their events earlier this year). With creative ideas this church has raised over $8,500.00 for water projects for ERDO. We know this will go a long way to providing clean, accessible and safe water for communities. Access to clean water has many benefits, other than the obvious that clean water avoids the risk of water bourne diseases that were previously a risk from contaminated water sources, access to water means that children can attend school because they don’t need to spend hours a day fetching water from long distances. Access to water also helps to protect, especially women, who previously had to travel long distance to isolated locations where there was a risk of being assaulted or raped. Mothers can also spend more time with their children or on income generation because less time will be spent gathering water. Maybe you’d like to check your latest water bill and see how much it would have cost you to participate if you joined Hay River’s challenge? We love the creativity of this idea and also the perspective that we can gain by being reminded of how easy it is to take for granted our access to water. 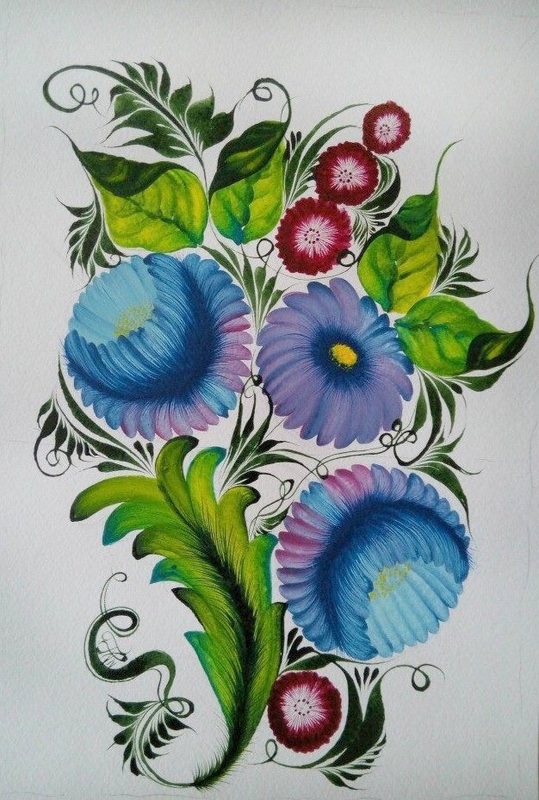 We’re inspired by Hay River’s creative events and we’ll feature more on this blog. Stay tuned and check back. 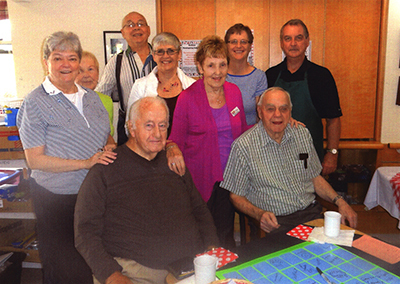 To celebrate Christmas 2012 the staff at Linhaven, a nursing home in St. Catharines, had a creative idea. They decided that instead of giving each other Christmas gifts they would combine the money they would have spent on gifts and use it to cover the cost to sponsor a child in Honduras for one year. For Christmas 2013, they plan on doing the same thing to continue their sponsorship of Eduardo. Thanks Linhaven! Eduardo Jose’s life is changed because of this generous Christmas gift! Inspired? Maybe you’d like to consider doing the same thing with your coworkers this Christmas? We invite you to go online and choose your child. After completing the secure online signup you will receive a printed copy of your child’s profile that you could post on the fridge at work. Check out www.erdo.ca/sponsor-now to sponsor a child today. 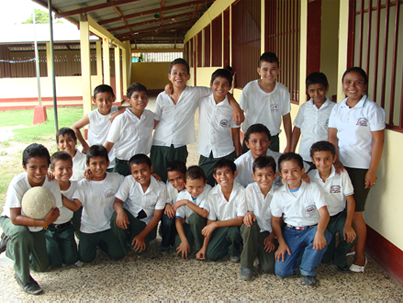 ChildCARE Plus, ERDO’s sponsorship program, currently has over 7,000 children who are sponsored. That’s over 7,000 children’s lives that are being impacted because of caring sponsors in Canada and other parts of the world! There are many other children who are waiting to be sponsored, and here are two brief stories of children that could benefit from your sponsorship. Eugene is 12 years old and lives in Ghana. 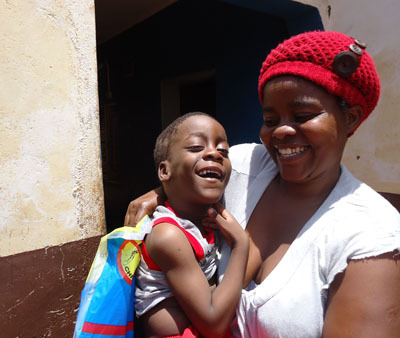 He was previously living with his mother on the street, but with no reliable source of income his mother was unable to properly take care of him. Eugene’s grandmother brought him to a children’s home where he is currently waiting for a sponsorship, which will provide him the opportunity to attend school. 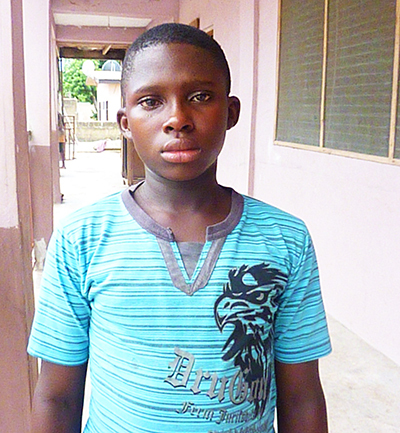 Although the schools in Ghana don’t charge school fees he is currently unable to go because he needs school supplies and a uniform in order to attend classes. 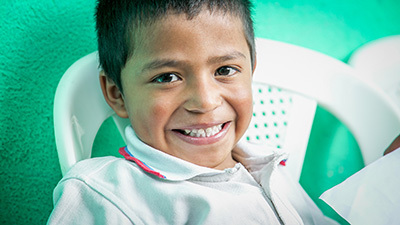 Sponsorship would give Eugene much needed hope for his future, along with helping to provide for a quality education, clothing, food and proper medical attention. 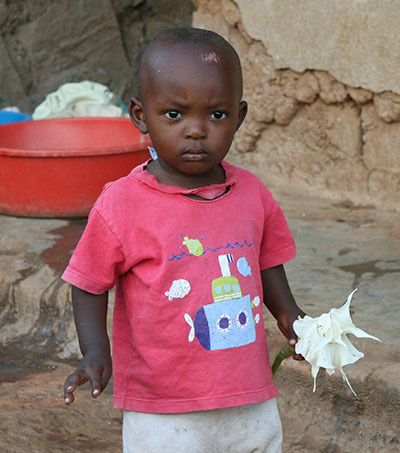 Irine is another child patiently waiting for a caring sponsor. She lives in Tanzania, a small country on the east coast of Africa just south of Kenya. 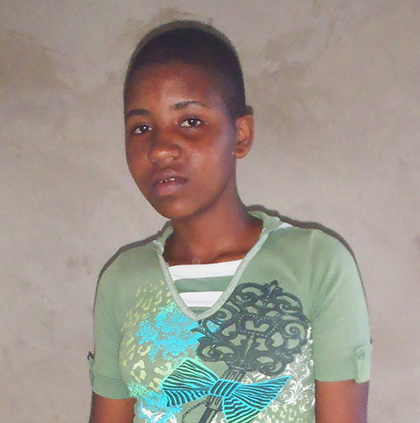 Now 13 year’s old, Irine was abandoned by her parents when she was younger and left in the care of her aunt. Irine’s aunt does not have a reliable source of income and struggles greatly to be able to care for the needs of the whole family. Life is a daily struggle to survive. Irine’s schooling requires various fees throughout the year which her aunt finds challenging to be able to pay and sometimes isn’t able to. 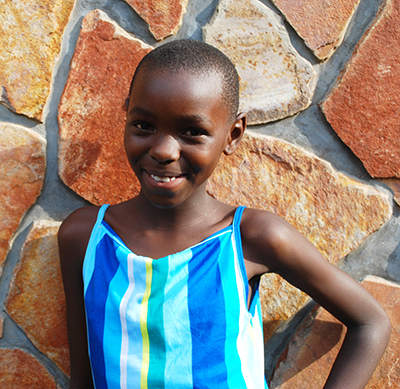 Sponsorship will ensure that Irine’s studies are uninterrupted and that she is able to complete her education. What’s a 6-70 party? We didn’t know right away either but we love this creative idea. Read on to find out. This past May the senior pastor of Hay River Pentecostal Church, Rev. 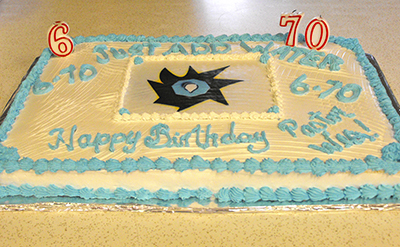 Wesley Dyck, turned 67 years old and the church celebrated his birthday in a unique way. They hosted a 6-70 party where they asked each guest to bring $6.70 to give towards water projects to honor their pastor’s special day. At the beginning of the year they hosted a bake sale. To celebrate World Water Day on March 22nd they asked people to count every time they used water that day and each time water was used it cost them a dollar. Their daily totals were then donated to the church for the water projects. 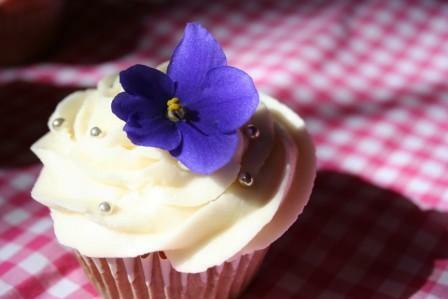 We’ll feature more of their fundraising events later this month on this blog. Stay tuned. The Wezesha Project, ERDO’s microfinance program in the Democratic Republic of Congo (DRC), began in January 2011 and has provided over 4,500 loans to an amount totaling more than $500,000.00. Life in Eastern DRC changes dramatically so we’ve had to be flexible. Since Wezesha Project launched in January 2011, we’ve faced conflicts, insecurity, large economic swings, riots and lack of basic services. The DRC is the poorest and least developed country in the world according to the United Nation's 2011 Human Development Report. The constantly shifting context means that Wezesha Project has to be constantly changing in order to have ongoing success. 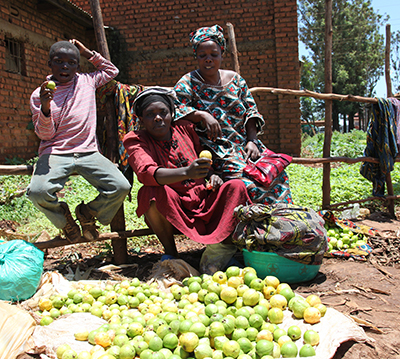 As of the end of September we have 1,340 women borrowing from Wezesha Project representing 9,380 family members. We have provided more than 4,500 loans between $50-$400 USD totaling more than $500,000 USD. On top of this, we have created 17 full-time jobs. Although only one loan has defaulted so far, we’ve had a number of women come close to defaulting. Life for our borrowers is incredibly difficult. The margins between success and failure and in many ways life and death are thin. There is no safety net, no social service, no credit cards, no free health care, and not many opportunities for help as all friends and family are in the same position. When there is no money, there are literally no options; this is life on the edge. This is intensified even more in the village. I sat at our Kiliba Village Lending Post recently discussing something outside the office with one of our team members. As usual, the kids gathered to see the Mzungu (white person) because there are never any in the village, but it wasn’t this group of kids that caught my eye, it was one toddler who was no more than 2 years old who came around the corner and looked as if he was afraid of something. He would spontaneously cry as if he had gotten in trouble and my Congolese colleague saw me watching the child as he came towards us. He said to me ‘This is not fear, this is malnutrition.’ Instantly I could see it, although it’s amazing how you learn to look past it; no shoes, no pants, tattered shirt and distended belly. This is life in Congo. This is where we work, close to the edge. The loans we give out go to women on the edge provide an opportunity that may be their last option but these loans don’t guarantee a safety net. One bump in the road, like a sick child, insecurity or a family death can cause catastrophe for the women in Wezesha Project. Over the last 6 months we have seen a surge of late payments in Kiliba, some women falling behind by more than $180 USD on $250 USD loans. They were on the edge of default. In fact at one point we had 64 of 225 women who were late on their payments between $3-$189 USD. 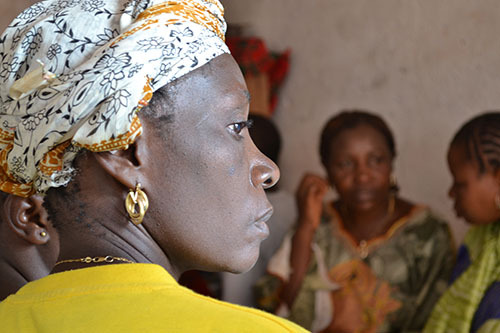 As a humanitarian program we make it extremely hard for women to default on loans. Our ultimate goal is to empower women to improve their lives through their own hard work. When women are struggling we don’t just forgive the debt. What we do is shrink payment sizes, extend loan terms, provide more teaching, and help women to get back on track so they can regain their footing on the road to empowerment. There are a variety of reasons for late payments. There has been insecurity in the region which has hurt the local economy and ability to go to their fields safely. Some have misused money, sending it with their husband into the bush where there are rumors of prosperity in minerals. A few have gone to money changers and received counterfeit money, and one has been robbed in her home, costing her the more than $300 USD in savings she developed by her third loan. Despite the increase in late payments, we don’t panic. Our staff assess the situation and prescribe individual plans for each lending group with late borrowers. We reteach, retrain, and never stop giving loans to those groups that are making payments on time. It is this hard work that has allowed us to reduce the number of women who are late in Kiliba from 64 to 31 since the middle of June, and brought this village lending post back on track. Wezesha Project is having overwhelming success in a place where success stories are hard to find. This success is not without its difficulties. However, the success and life change through Wezesha Project is undeniable. Thank you for your continued support. 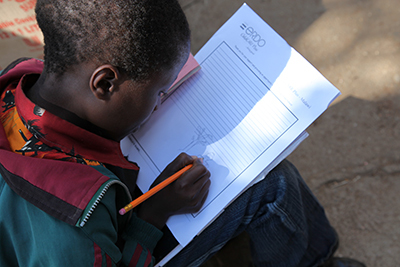 Something we hear from our sponsors is that they aren’t sure how to start writing a letter to their sponsored child. Tell your child that you are thinking of them and that you pray for them. Sharing that someone far away is thinking about them can make your child feel very special. Tell them about your family: How many people are in your family? You could send them a photo. Ask your child about their family, country, customs and culture? Tell them about your neighborhood. Do you live in the city or the country? Describe the seasons: Does it snow a lot where you live? What does snow look like to you? Tell them about your work or school. Ask them what their favourite subject is in school. Share what you wanted to be when you were in school. Tell them about your church. Share what your favourite food is and describe what it’s like. Discussion of politics - as it can be a sensitive issue and in some more extreme cases could cause problems for their family. Sending certain photos - Give careful thought to the pictures and photographs you send. For example, images of people in swimsuits or showing material possessions may create awkwardness. Being too familiar - What is acceptable in our country might not be appropriate in the child’s culture. It’s always good to err on the side of caution. Parents of a sponsored child might be offended or concerned by open expressions of affection made toward their children. 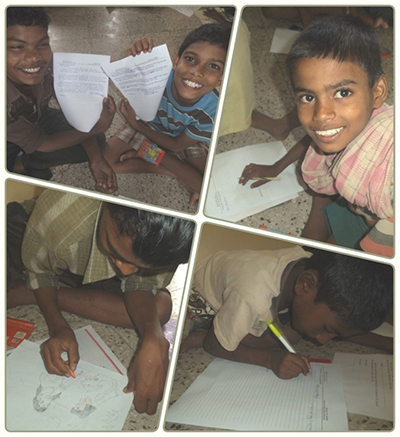 Sharing too much regarding your personal struggles – Your sponsor child will be excited to receive your letters. This is an opportunity for you to encourage them. Talking about wealth or privileged circumstances – This may make a child feel ashamed or deprived. You can mail your letters directly to ERDO – ChildCARE Plus at our Mississauga address below. Or e-mail a letter to letters@erdo.ca and we will forward your note on to your child for you. Do you have any ideas you’d like to share with us? E-mail us at info@erdo.ca so we can share your ideas with others. 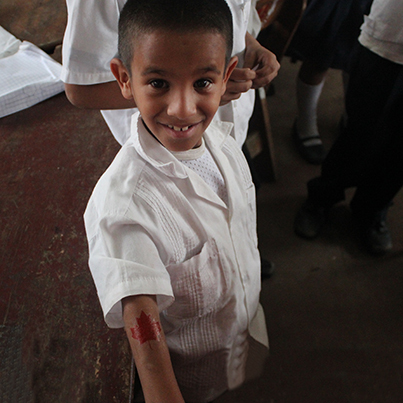 This summer a text message stopped me in my tracks: “No children have fainted in class for the past two months.” It was from our Program Officer who was in Honduras at that time. Due to difficulties with internet connections, she wasn’t able to explain much more until her return. What I found out later was that prior to the start of the in-school feeding program in Honduras, the teachers reported that students were often fainting in class. Can you imagine being that hungry? Now, through ERDO’s intervention, a daily amount of food served in the classrooms resulted in children that are happier, healthier and better equipped to learn. We’re so encouraged by this program that is operating in three areas of Tegucigalpa and feeding 1,203 children from the kindergarten to grade 6 and 300 preschool children. As we prepare to remember another World Hunger Day, we have some more food-related news to share. Food production in Zimbabwe has been impacted by a number of natural and man-made factors that are pointing towards the worst food insecurity in more than a decade. ERDO is planning a response with CFGB and will be raising funds to feed families in crisis. Watch our website for updates. Through a food assistance project in Afghanistan 1,035 people are learning agriculture and horticulture techniques. This leads to more secure, predictable sources of food. It’s one of my personal goals to always be grateful and to show an attitude of gratitude. It’s also one of our core values here at ERDO. We have so many things to be grateful for as we approach this season of thanksgiving. Colossians 3:15 tells us to be thankful, “Let the peace of Christ rule in your hearts, since as members of one body you were called to peace. And be thankful.” (NIV) The end of Colossians 3:17 in The Message translations says, “And sing, sing your hearts out to God! Let every detail in your lives—words, actions, whatever—be done in the name of the Master, Jesus, thanking God the Father every step of the way.” This gives a great practical description of what being thankful looks like, thanking God the Father every step of the way. Soon here in Canada we will celebrate Thanksgiving weekend with family and friends, a time that we set aside to be especially thankful for everything in our lives. We wish you and your family a happy Thanksgiving! We’re thankful for you. On Friday it’s the International Day of the Girl Child a UN observed day to raise awareness of the issues that girls face around the world. This is its second annual observance, with the theme of “Innovating for Girl's Education”. 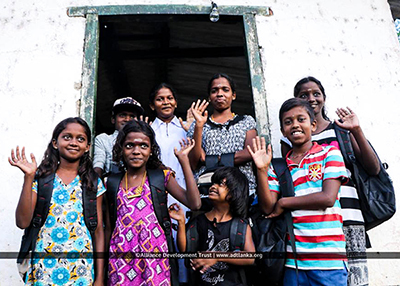 On this day, many community and political leaders talk to the public about the importance of a girl's right to equal education and their fundamental freedoms. Various events are held to promote the work that is being done to empower girls through active support and engagement. Although access to education for girls is improving, many girls are still not getting an education, with over half (54%) of children out of school being females. There are many factors that prevent girls from attending school. Travel to the school is sometimes unsafe, especially for girls walking long distances alone. Families may not be able to afford to send all of their children to school if they are able to send any at all. Families may also not be able to send their children to school as they need the income they could earn during the time they would be in class, or they need them to take care of younger siblings. In some cultures the value of education, especially for girls, is not understood. Even when girls are in school, perceived low returns from poor quality of education, low aspirations, or household chores and other responsibilities keep them from attending school regularly. Statistics show that there are many benefits to education for girls themselves and their communities. Over the past four decades the global increase of education for woman has prevented over four million child deaths (http://www.un.org/en/globalissues/children/pdf/educationfirst-facts.pdf) A child born to a literate mother is 50% more likely to survive past 5 years of age. 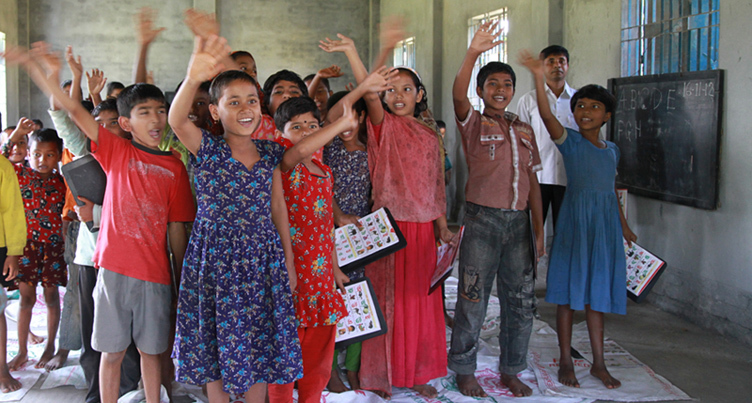 When children are sponsored through ChildCARE Plus they are able to get an education. Out of the 7,000 children who are currently sponsored in our ChildCARE Plus program 3,550 are girls. We celebrate this! 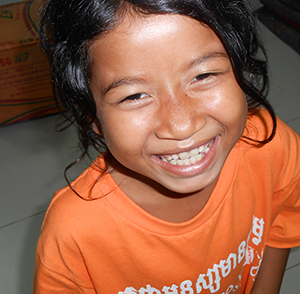 Consider sponsoring a child and helping provide education for one more girl. With this there is great potential that it will transform a community. Imagine being a mother who is worrying about how to feed her children their next meal. Imagine living in a country that doesn't have social assistance programs and having little or no education that could help you to improve the circumstances for you and your family. Imagine living in a culture that offers women little opportunities. This was the situation for many women in the Democratic Republic of Congo before they were given loans through ERDO's Wezesha program. Wezesha is the Swahili word that means to empower, and that is what this program does. With guidance from ERDO, women form lending groups. These groups provide accountability and support throughout the lending and repayment process. 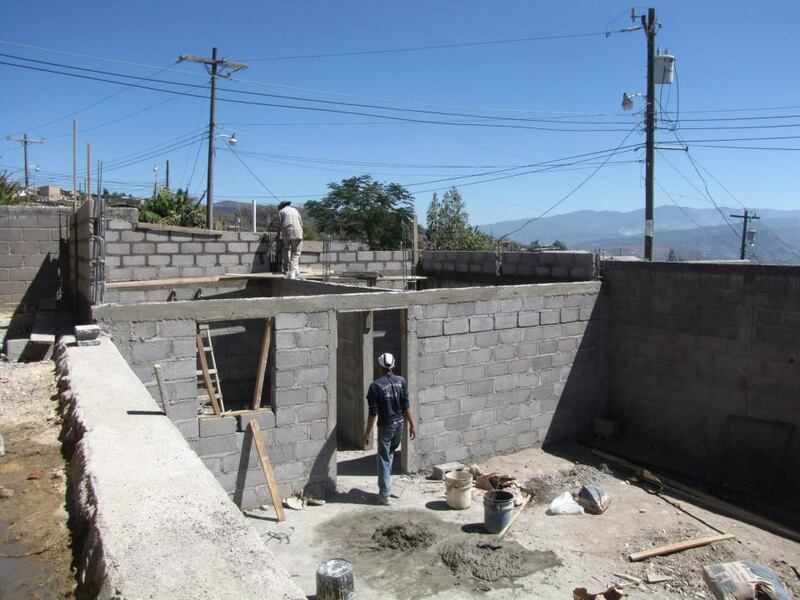 Once approved, each member receives a home and business visit and goes through a week-long pre-loan training process. After this, they receive their loans starting at $50USD. They repay the loan at a Wezesha Project Lending Post on a weekly basis, which enables project staff to track progress easily. Once they repay, borrowers are eligible for another loan, up to double the size of the previous loan. This helps build strong businesses and provides a large incentive for borrowers to repay. Mama Mbalingambi's story is one of many of the women's stories who are part of the Wezesha program. At minimum she is the second generation in her family to struggle with poverty. As a girl growing up, she was the least likely in her family to go to school and never had the opportunity to complete school. Now with a family of her own she didn’t have enough money to feed everyone or to send them to school. 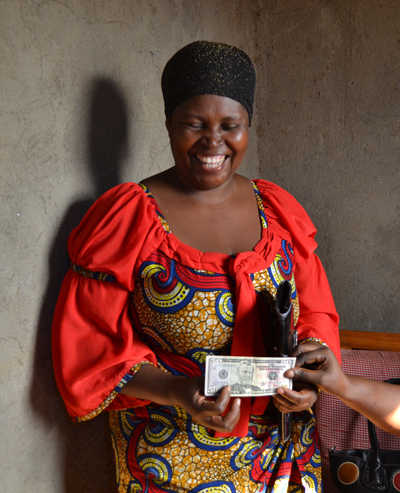 In September 2012 Mbalingambi received her first loan of $50USD from Wezesha Project. After her training she knew to invest this money into her business. 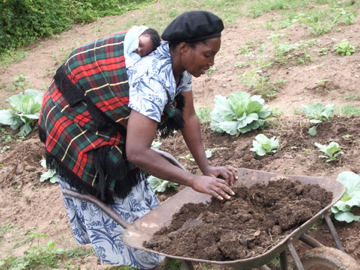 Mama Mbalingambi was able to feed her family, send all her children to school and develop a savings of $30USD. At the end of January 2013, she finished repaying that loan. Mama Mbalingambi has also gone back to school to work towards getting her diploma. She is an incredible woman who is making the most of her opportunity through Wezesha Project. She has now received her second loan of $100USD. In September 2013 we held our 2nd annual ChildCARE Plus Kids Camp. The theme this year was, "You Are Valuable". It's a theme that our CCP staff thought long and hard about. We wanted to remind our kids that they are worth so much, not only in our eyes and their sponsors’ eyes but in God’s eyes too. Often at home could be viewed as simply a worker, not as a loved child. So for two days these kids are the center of attention. They were placed in groups where the leaders engaged and encouraged them; they were actively shown love by caring leaders. For two days of the year they can truly be kids! We had about 140 sponsored children and 30 volunteers in attendance. Some of the children who attended are currently sponsored and others are waiting to be sponsored. Everyone was included. We had to make two trips with three vehicles to transport the kids from one of our sites. They loved it and for some it was their first time in the city. 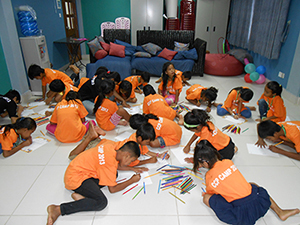 The camp was divided into 6 colors or teams and each day consisted of games, crafts, songs, letter-writing, photo-taking, bible lessons, movies, services and more. The children were fed three large meals along with two snacks each day. There was so much food that many of the kids took it home to share with their families. At the end of the camp each child went home with a bag full of goodies, both treats and hygiene products and a children's version of some bible stories. They were ecstatic! During our four services the children performed traditional dances, sang to the top of their lungs and cheered when the game scores for the day were revealed. I would like to thank The Park Church in Sherwood Park, AB who sponsored the majority of this camp. If it was not for them our camp would not have been possible. Thank you for giving! Overall is was a great time together and we look forward to next year when we will have even more children sponsored who can join in on the fun. 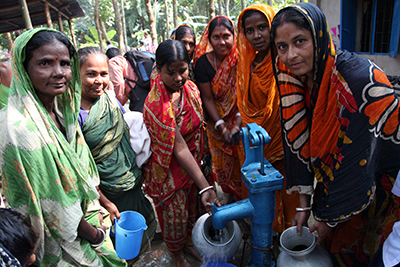 Thanks to Glad Tidings Pentecostal Church in Cochrane Ontario four villages in Bangladesh have access to clean water in their communities. Albina (22) lives in Jharbari located in Dinajpur district, Bangladesh. She is a housewife and has a 9 month old son. 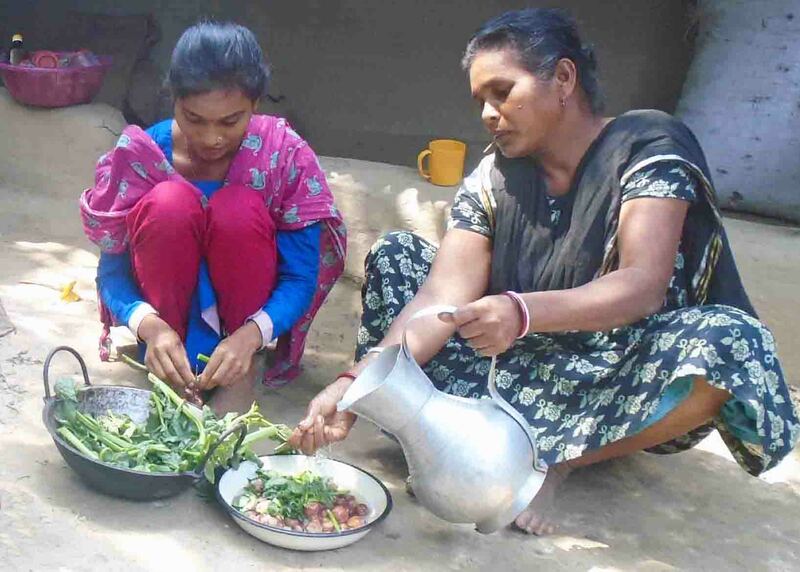 Her husband, Baburam (28) is a daily labourer who works in the fields of others. They have no land of their own. Baburam receives wages on a daily basis as he finds work and the family struggles to survive on less than a dollar a day. Albina and Baburam now have access to clean water because of Glad Tidings’ gift of a tube well in Jharbari, one of the four villages that received tube wells. Before the new tube well was installed in the centre of the village, Albina had to spend several hours a day walking to the government tube well several kilometers from her village. This left her exhausted and often ill from the oppressive heat; as members of the poorer villages are shunned and must collect their water during the least busy times of day. It also meant that to carry enough water to last for the day and overnight, she had to leave her baby in the care of others. Collecting the daily water is now a simple 5 minute walk to a clean safe area. 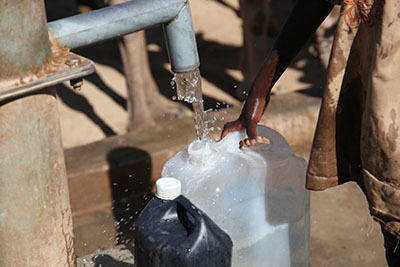 She can collect water several times a day if necessary and has no fear of being turned away from the pump. Having water so close at hand also means that Baburam has fresh drinking water to take to the fields with him when he works. 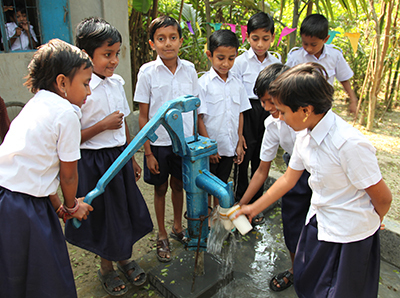 When Glad Tidings heard about water projects, the congregation got excited and began to give. They were encouraged to see the impact in people’s lives and that it was through the love of Jesus that this work was done. Being a smaller church they found that water projects were something they could give to because the costs were manageable. For a relatively low cost they were encouraged with the measurable difference that was made. The church has even added a water well fund to their annual budget! Thank you Glad Tidings Cochrane! 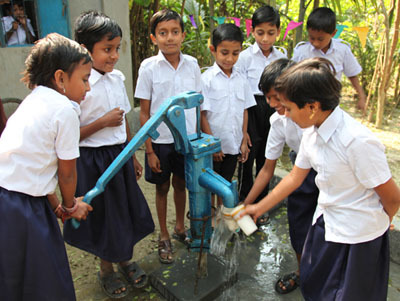 Maybe your church or a group of friends would like to raise funds for a water project? For some fundraising ideas go to www.erdo.ca/events . I was the youngest of eight children living in a small village in India. Of all of my siblings, only one of my brothers attended school for a short time. Our family was very poor and since there wasn’t enough money for adequate amounts of food, education was much lower on the priority list for me and my family members. We were powerless. On my own, I was powerless to change my situation. I was powerless to get an education - to have a better future - to break the cycle of poverty that held my family for generations. That was my situation until I was nine years of age. At the age of nine I was able to get an education and learn about Christ at the Prem Sewa Boy's hostel, through the support of ChildCARE Plus, ERDO’s child sponsorship program. 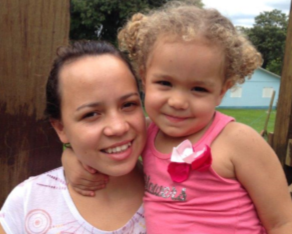 ChildCARE Plus and my sponsor enabled the power I needed to break the cycle of poverty. The school changed my life in so many significant ways. Physically, for the first time, I had enough to eat. Intellectually, I was able to study and advance far beyond the level the village school could have offered. The most significant impact was a spiritual one. I got a chance to hear the Word of God and that changed my whole life. After I graduated from the school, I went on to university. After graduation, I received two postgraduate degrees—a Master’s in Sociology and in Psychology. I presently look after 1,275 children as the Director of Prem Sewa Shikshan Sangh. The children in our care flourish in three homes; two for boys and one for girls, and in two daycare centres. As I look back at where I was as a powerless child, and where I am now through God’s grace, it is beyond my imagination. Now, because of the support I received, I have power - power from God to help many more children who are powerless to become powerful. Gabriela is now ten years old and I’ve been sponsoring her since she was five. I am always happy when I get a new photo or letters from her. Last year I sent her a photo of my husband and I. A few months later I received a few of Gabriela’s baby photos. This was really touching because the photos looked like they were well worn, like they might have been her family’s only copy of them. Giving – What could I do? School is Not Out for Summer - It's Back! 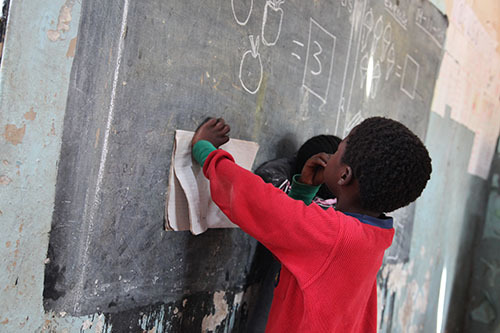 ChildCARE Plus child sponsorship provides a way for children to get an education. 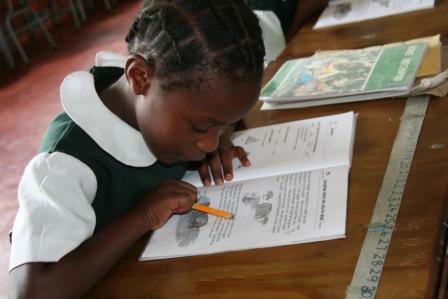 Children are able to learn to read and write which will open up opportunities for their future. They also receive food, shelter and medical aid. Our strategy goes beyond meeting the physical needs of children, but also meeting their spiritual emotional and intellectual needs (the whole person) by presenting the gospel and demonstrating God’s love. We believe this holistic approach helps children to break free from the cycle of poverty and enables them to contribute back to their community. Scripture is clear that God has a heart of compassion for the poor. But what does it mean, exactly, to have a “heart of compassion”? Is it giving money? Praying? Reading articles and becoming informed? How can I take my mild interest and transform it into what the Father is looking for? I can’t. But God can. For me, it was a process that began with prayer. When I realized how far short I fell from where God wanted me to be, I asked Him to broaden my horizons. I had no idea what that meant, but I started reading the newspaper to gain an understanding of world events and tried to strengthen my weak geography. I sponsored a child through ERDO for years, and gave regularly to missions but God wanted to develop a passion in me for the marginalized and brokenhearted. He wanted me to find my voice. “Speak up for those who cannot speak for themselves, for the rights of all who are destitute. Speak up and judge fairly; defend the rights of the poor and needy” (Proverbs 31:8-9). The change in my heart began when I started to write for ERDO. I wrote about Bapu Desai from India, who received his education, regular meals and spiritual training through the support of ChildCARE Plus. He graduated and is working on his third postgraduate degree. As managing director of the school where he was educated, he now invests in the lives of children like himself. I was horrified to learn about “throwaway children” in Tanzania, one of whom was discovered as a baby in a latrine. I learned the importance of having PAOC global workers and ERDO national partners present to assess the need and help connect children with sponsors. I began to read the news differently. Whenever I read about a crisis, my first thought was, “I wonder what ERDO’s response is?” I learned that when natural disaster strikes, ERDO is there, often before other agencies have a chance to respond. I wrote about the floods in Thailand, and how ERDO provided filtered water systems. Forty-two water filtration systems were purchased and installed in churches, community centres, schools and apartments to supply free, clean water. In Japan, ERDO worked with partners and existing churches to clean up the damage from the earthquake and tsunami. 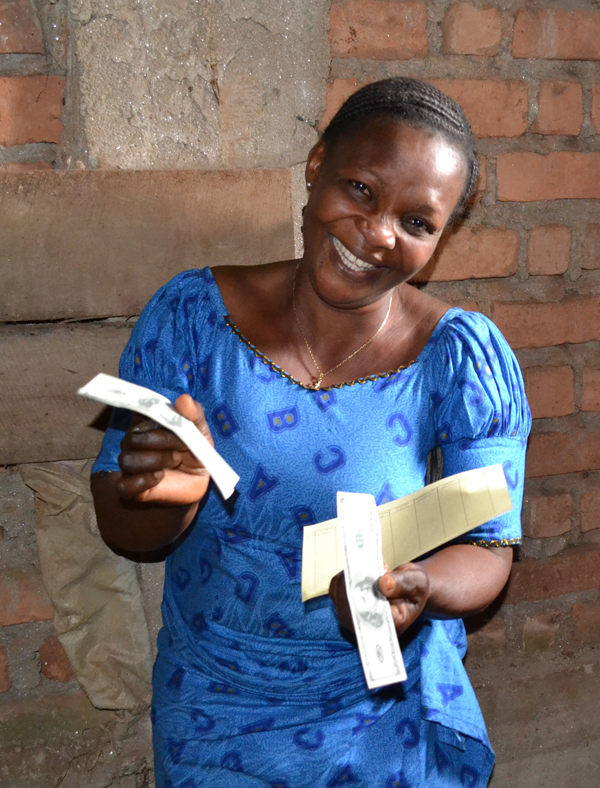 The first time I wrote about ERDO’s microfinance project (called Wezesha, the Swahili word for “empower”) in the Eastern Democratic Republic of Congo, I was excited about the impact it was making in the lives of women, and ultimately, families. Small, monitored loans were given to women with tiny businesses. With this money they re-invested in their businesses (or bought supplies), paid back the loans and supported their families. As I interviewed Mike Boomer, project co-ordinator, and heard about the struggles and triumphs of the women, I had a revelation. They are just like me. As women, they worry about their children’s futures, work hard to feed and care for their families, and need support. They love to get together and share their stories; they are proud of their accomplishments. Suddenly the miles melted away. I received the same message when I wrote about Mare, who lives in Kenya. 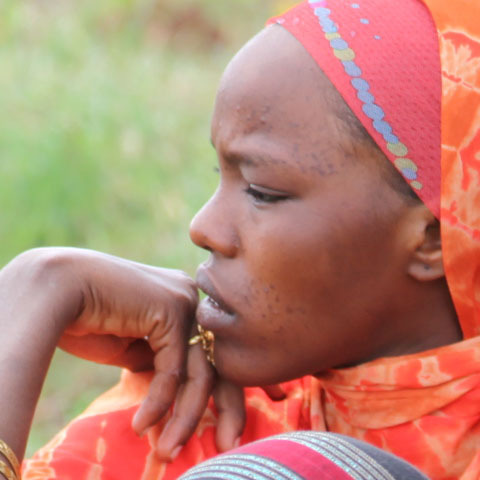 Her status in the community was radically changed when she received a camel through one of ERDO’s partners. I heard her say, “Now, when I talk in community meetings, I am listened to. I am a camel keeper.” I caught the satisfaction in her voice and could almost see her standing a little straighter. It’s been an incredible journey. I’m still a work in progress, but I’m not the same person I was when I started. God has grown in me a compassion for the poor and given me a voice to speak for them. I’ve learned that I do know the person on the other side of the world. She is just like me. “Rich and poor have this in common: The LORD is the Maker of them all” (Proverbs 22:2). My youngest son and I are starting to do a count-down to heading up north to a friend’s cottage and spending a few Mom/Son days playing board games and swimming in the lake. It’s funny how going to a cottage can make you appreciate your city/suburban access to water all the more. You take extra precautions around making sure the cottage water is clean and drinkable, shower more quickly and less frequently, use less unfriendly soap products and generally flush a lot less. In developing countries where I’ve travelled, I’ve needed to adopt an even more cautious attitude to water as I’ve got a weakened ability to fight off water-borne parasites. Some in my family have called it my African weight loss program, but I call it a gastric nightmare. A lot of people don’t realize that diarrhea occurs world-wide and kills around 2.2 million people* each year, most of those being children living in developing countries. There is pain and suffering in such a death, and no child should have to endure that. Swimming in many of the developing countries I’ve been was also out of the question because of water-borne diseases such as Schistosomiasis (also known as Bilharzia) which is caused by parasitic worms, or Cryptosporidiosis which basically happens when animal or human waste mixes with water used for drinking or swimming. If you plan on travelling, the CDC (Centers for Disease Control and Prevention) has a lot of helpful information about food and water precautions on their website at: http://wwwnc.cdc.gov/travel/yellowbook/2012/chapter-2-the-pre-travel-consultation/food-and-water-precautions. Many people living in poverty in remote communities don’t have the luxury of some of their recommendations like clean bottled water, or safe water to bathe in on a desperately hot day. The World Health Organization also states that 1.1 billion people lack access to improved water sources and 2.4 billion have no basic sanitation. 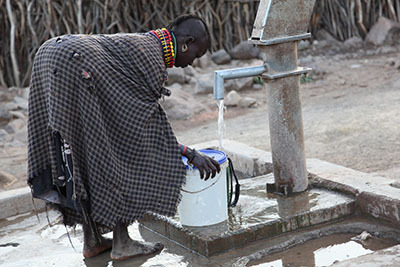 This is why ERDO is so active in our work to bring water to communities around the world. Whether a tube-well in Bangladesh or a drilled well in Kenya, clean water makes a difference and can save lives. In a couple of weeks when I take a swim with my son or pour each of us a cold drink, I’ll definitely think about those who don’t have these simple luxuries, and be even more inspired to help. If you’re grateful for the gift of clean water and want to share this blessing with others, click here to read more. What’s the Cost of Clean Water? Does the cost of water remain the same for every well that is dug? We’re sometimes asked this question. The cost of a water project varies depending on various factors like: whether it can be hand dug or needs to be drilled, how far the drill needs to go to access the water table, the type of ground that is being dug into since it’s more difficult to dig a water well in areas which are rocky, the type of equipment needed, and the accessibility of the equipment to the drilling location. Not every water project that ERDO does involves water wells. 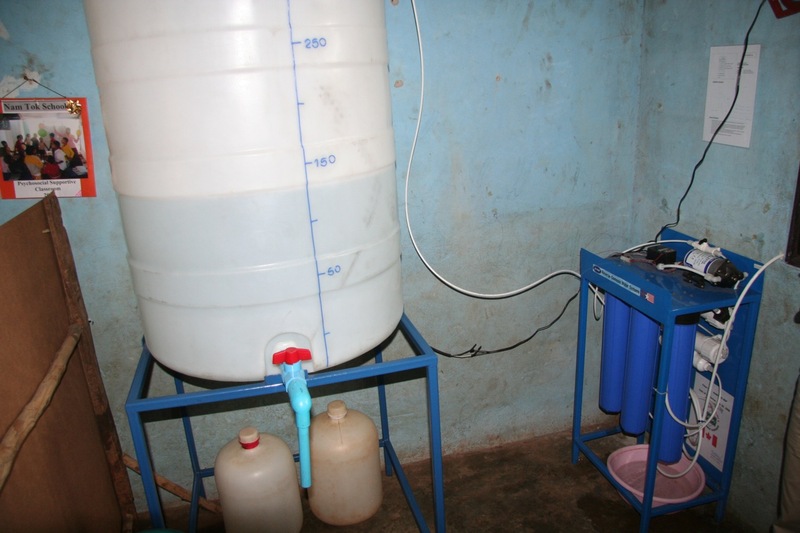 Sometimes what is needed to provide clean water for a community is a water filtration system if the issue is not access to water but how clean the water is that is available. These costs also vary depending on the filter that is available and how it operates. A few examples: A more expensive well was one that was dug in Guatemala. It cost over $40,000 as it required digging far down through volcanic rock to get to clean water. 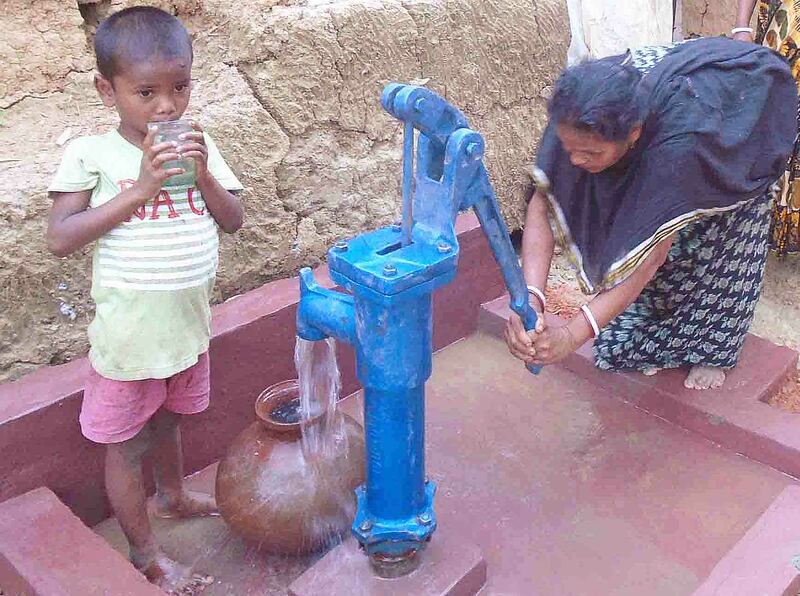 The tube wells in Bangladesh cost around $750 - $850. ERDO also ensures that the community is able to maintain the well and keep it functioning. Thailand – cost per system $1,250 – Three water filtration systems are needed for schools and surrounding community. The text message I got from our Program Officer this past weekend was one that stopped me in my tracks. With the internet not working she was only able to key in a few short words to illustrate what a difference our in-school-feeding program was making in Honduras. The message read: “no children have fainted in class for the past two months”. Children were fainting from hunger at the school. Now, a simple daily amount of food served in the classroom is making a difference in the lives of children. 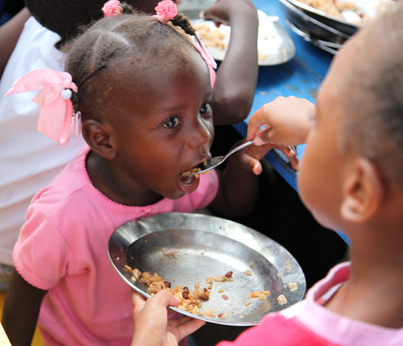 Hunger isn’t taking a holiday this summer so please support local food banks and programs like our in-school feeding ones in Honduras, Bangladesh and Kenya that make such a difference. In June shortly after students of Anson Park Public School in Scarborough Ontario heard about the collapse of the Rana Plaza in Bangladesh they thought about what they could do to help. A few of their grade four students suggested that they host a bake sale. Many families sent in baked goods. Their bake sale raised $380.00 to help victims of the building collapse. Thank you students of Anson Park! 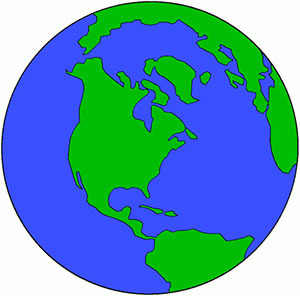 ERDO has a neighbor, and that is the world. Inspired by a loving God, our mission is to provide compassionate, practical assistance to strengthen people and communities in developing countries through the four areas of: crisis response, food assistance, child sponsorship and community development. Every day, through ERDO-affiliated PAOC (Pentecostal Assemblies of Canada) Global Workers or trusted partners, we are reaching out to populations living with poverty, injustice and suffering. Our work is transformational on three levels: the mind, the body and the spirit. Scripture instructs us to be radical in our care for people in need. As in the story of the Good Samaritan, who found the stripped and beaten man at the side of the road, we have found our hurting people in all sorts of terrible circumstances: women who have been beaten and raped, children who have lost both parents to war or disease, babies that were thrown away. While our reach is not always to people living in such obvious dramatic and tragic circumstances, who can say that we should overlook the more silent injustices of hunger, illiteracy and disease? ERDO’s practical and personal care in 2012 meant that hungry men, women and children in the Sahel Region of Africa received emergency food. As a founding member of the Canadian Foodgrains Bank, ERDO was recognized in part for the generosity of our churches from the Canadian Government. In a March 5th reception to honour the 30th anniversary of the Canadian Foodgrains Bank, The Honorable Julian Fantino said, “It speaks volumes” that 40% of the donations for the Canadian Government’s 2012 Sahel Crisis Matching Fund came through the 15 churches and church agencies that make up the Foodgrains Bank.” The church is a powerful agent of compassion – but there is so much more we could be doing. In 2012 we celebrated our 20th anniversary of the ChildCARE Plus child sponsorship program. After 20 years, some of the children whom we have come alongside are now leaders in their own Christian ministry. Bapu Desai from India is one such young man. Having received his education, regular meals and spiritual training through the support of ChildCARE Plus, he has now graduated and is working on his third postgraduate degree. As managing director of the school where he was educated, he now invests in the lives of children like himself. The gift of love to a child like Bapu has been multiplied, and is now spilling over, reaching out to others. ERDO’s work this year is mostly planned, but as in any organization assisting emergencies, we also operate in a responsive manner to the earthquakes, typhoons and droughts that wrack our neighbours. 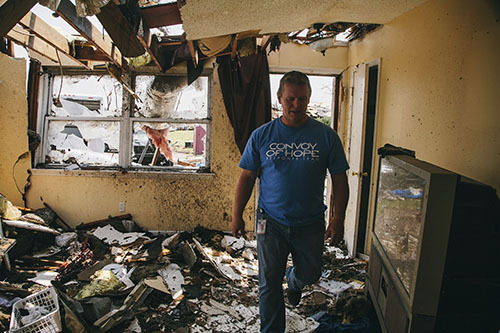 We are currently responding to the needs for the victims of the Rana plaza collapse in Bangladesh, the Tornado Response in Moore, Oklahoma and the political conflict in Syria. Even more recently we are forwarding funds to assist in the flooding response in Alberta. We are asking neighbours and friends like you to help equip ERDO for the emergencies that are here and those that will come. ERDO’s story is a story of following Jesus into the complexity of the world and inspiring people to help their neighbours. Support this vision and help us reach, inspire and enable a whole new generation. Keep visiting www.erdo.ca for church resources, children who need sponsors, or to make a gift of support. For many elementary students across Canada, today is the last day of school or school ended earlier this week. The end of the school year comes with mixed emotions, a sense of accomplishment with graduations being celebrated and sadness about moving on. It seems that older students are more anxious for summer to start but for younger ones the summer is greeted with a bit more sadness about missing their teachers and school friends. When I was in high school I loved when they played ‘Schools Out’ on the PA system. I felt like dancing through the hall ways as my mind was already on water sports, camping, swimming and trips to the beach. School’s not out for the summer in some other countries around the world, as seasons and school terms vary. In Honduras students are in the middle of their school year right now and in Thailand students started their first semester at the beginning of May. In the Democratic Republic of Congo (DRC) their school year ends in July, school is in, in these countries. 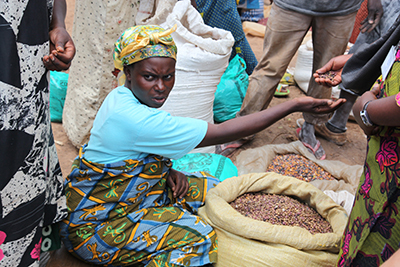 Wezesha Project is ERDO’s microfinance program in the Eastern Democratic Republic of Congo (DRC). We are working with the extreme poor who are in very vulnerable situations. Throughout the country, the average person lives on just $0.86 per day. However, because this is the average it is brought higher by some individuals who are wealthy so it also means that there are individuals who are much poorer. It is hard for me to believe that there are people living on even less than $0.86 per day. Congo seems to be a land of extremes contrasts, a 30 year war amidst amazing beauty, extreme wealth and devastating poverty. This is the context of our work. Since January 2011, Wezesha Project has provided loans to 1120 women, dispensing more than 3000 loans between $50-$400 USD. That means more than $450,000USD in loans in a place where the average person makes less than $300USD per year. Talk about impact! Last week I was speaking to a World Bank official in Bukavu, DRC, talking about the realities of life here. We pondered the question together, how is it that people survive here? We couldn’t understand given the circumstances we see people living in every day. Then he made the sobering statement, “The fact is that they’re not. People are dying everyday.” A harsh reality that is the reason why DR Congo is the world’s least developed country according to the United Nations Development Index. This is why Wezesha Project is working where we do, not providing handouts, but empowering women to help themselves. We work under the assumption that each woman has a skill or ability, and by providing loans we want to empower them to do more with those skills. We are now rolling out our new graduation strategy to complete the empowerment process. 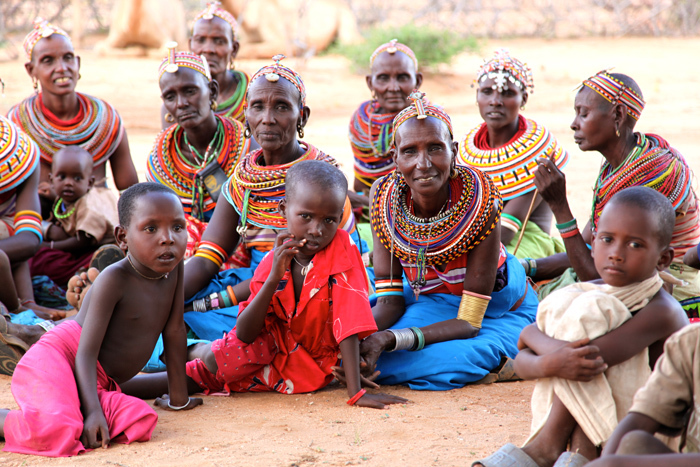 When women enter Wezesha Project, they are eligible to receive 8 loans over a 3-year period. During this time they begin developing savings of their own. When they complete payment on their 8th and final loan, Wezesha Project provides a grant to the women, to match their savings and complete the empowerment process. With this grant and their savings, women now have the capacity to continue their work alone, creating sustainable businesses. At this point we bring new women into the project to replace those who have successfully graduated, and the cycle continues. Sustainable businesses, a sustainable project, complete empowerment, Wezesha Project. We’re grateful for the role that fathers have in our lives, both from our biological fathers and those who had a fatherly role in our lives. Proverbs 13:22 says: “A good life gets passed on to the grandchildren; ill-gotten wealth ends up with good people.” (MSG) Fathers leave a legacy for their children. This legacy is not one tied to financial things but instead one of integrity and honesty; fathers call out the best in their children. Global Workers partner with ERDO, stepping into a father-like role to guide young people. Frank Juelich calls the boys and girls at the children’s homes in India, ‘my kids.’ Frank, Bapu and Yohan the leaders of the homes, among others, have father-like roles in many children’s lives. Many of these children are orphaned, but through living at the homes they are introduced to family. In ERDO’s work, like a father who encourages their children to reach their potential, we also seek to bring out the potential in the children we serve. 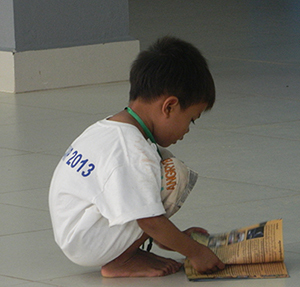 Through ChildCARE Plus child sponsorship children are given the opportunity for an education. Education helps to equip them with the skills and values they need to build a future for themselves. So, dads and other fatherly men out there, we wish you a happy Father’s Day! Thanks for making a difference in the lives of others around you. May you know the privilege of knowing that you have shaped the future of the next generation! She’s Destined for Great Things! Recently I had the wonderful opportunity to travel to Kenya and meet with my sponsored child, Destiny, in the capital city of Nairobi. After landing in town early that morning, I made arrangements with loving ChildCARE Plus field staff to meet Destiny at lunch first and then travel to her home to meet with her family afterwards. When I walked into the small, shaded outdoor patio of the café we were meeting at for lunch, I scanned the room to scope out an 8 year old girl who would resemble the photos I have received for the past year and a half. After a quick scan of the room, I locked eyes with a shy little girl with a look of astonishment on her sweet face. I walked over and greeted her and sat down for an enjoyable meal with her and the ChildCARE Plus workers. As she ate her cherished meal of kuku (“chicken” in Swahili) and fries, we regaled each other of stories about ourselves. As her shy outward demeanor started to strip away and she became more confident in spoken English, she told me about her family and her future aspirations of becoming a doctor. I told her more about myself and stories about life in Canada. We later drove and pulled up to a small stretch of land in a lush valley without electricity, where Destiny and her family called home. They live on a piece of land that they share with a small primary school that the three older children attend, and as we pulled up to the gate Destiny’s brother and sister came running up to the car to greet their visitors. At that moment I felt like much more than a visitor, I felt like a long-lost family member. We stepped outside, Destiny grabbed my hand, and we walked to her home: a small two-room, iron sheet house with an outdoor cooking area and chickens wandering around. 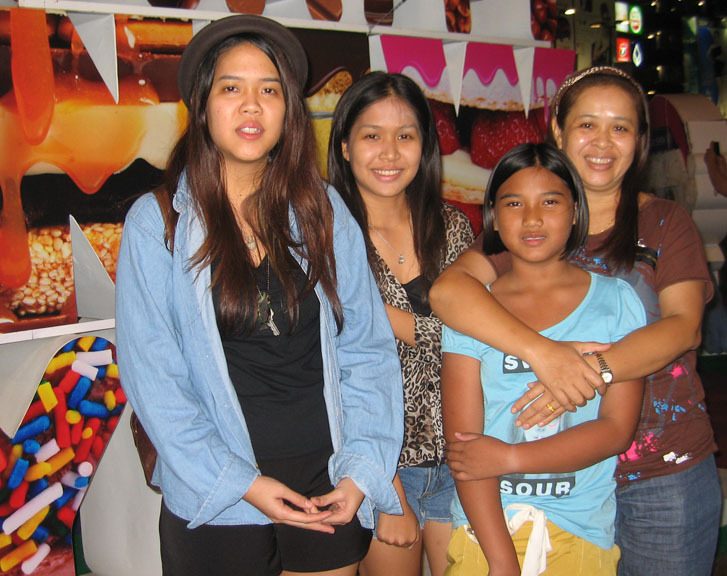 I received such a warm welcome from both Destiny and her family, my heart was overjoyed. We sat inside their home and talked about life and school. Destiny, her younger sister and her older brother told me all about life at school and showed off their new school uniforms as the new school term had just started that week. It was heart-warming to see the children this excited about class, uniforms and books … it has certainly been a while since I’ve seen a child so excited about school! Shortly after the school uniform fashion show, the three children got up and enthusiastically performed a song and dance they learned in Sunday School. After the performance the children took me on a tour of their school on the adjacent property. 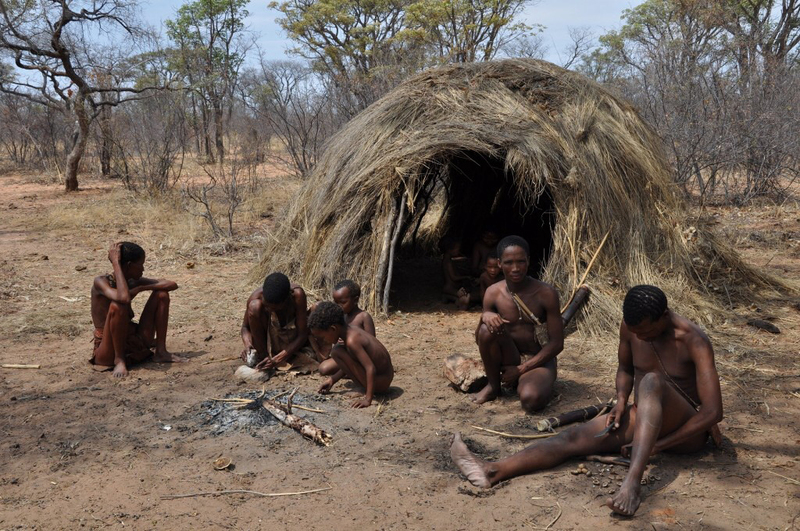 Though it was a simple wood and iron structure with only a few classrooms, they were so proud to call it their own. As we were saying goodbye, their mother, a single parent raising four young children, sincerely thanked me for the support I was giving to Destiny to allow her a better opportunity in life. I was humbled. How refreshing and up-lifting it was to meet with Destiny and her family, to see children with such bright smiles and even brighter futures! I am still dumb-founded by the significant, long-lasting impact that a seemingly small gift of $34/month can make on a family living in poverty. If my small monthly gift can have this impact on a child, it’s worth every penny…and then some. Destiny and her family will forever hold a special place in my heart. In an un-named country (Un-named for security reasons) seniors, many of whom are housebound, are receiving three meals weekly to their homes. The government pension for these seniors is about $5.00 monthly and is not nearly enough to provide for them. There is no social network that addresses the needs of the elderly and many are forced to beg or slowly starve to death. Caring volunteers from a nearby church prepare and deliver the meals. In addition to the actual food provided, the volunteers also offer comfort, spiritual guidance and much needed company to the recipients as they spend time with them. This church is showing the love of Christ to those in need. Life Offers Endless Choices: Where do we begin? I’ve often heard it said that when people return to Canada after living in another country outside of North America for a while, they are often amazed by the options available to them in food alone. I remember hearing of a missionary who burst into tears in the grocery store as she was so overwhelmed at the number of options for a loaf of bread. 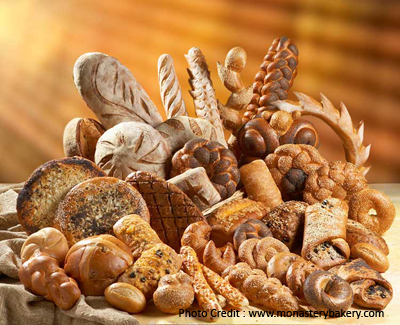 Even just buying bread there are endless options: white, whole wheat, rye or multi-grain, then there are several brands to choose from. We know that every day you have many choices to make, so we’ve created some resources to help you make some of the everyday ones, some of these are simple adjustments in the way we do things. Our choices make a difference, especially when it comes to how we use our resources. If we are able to make better economic decisions we can use these additional resources to help those in need. Check out our ideas at www.erdo.ca/choices and let us know if you have ideas you can share with us by e-mailing info@erdo.ca. Will You Be Out in the Garden This Weekend? What are you planning to do this long weekend? As Canadians we’ve been counting down the days and then hours until the first long weekend of the summer starts. Things like family trips, BBQs, camping and sleeping in could fill your leisure time or maybe you are part of the 82% of Canadians who think this weekend is the perfect opportunity to tackle some spring chores (taken from a poll done by Canadian Tire, cited on 680 News website, - http://www.660news.com/2013/05/14/canadians-spending-may-long-weekend-doing-spring-chores/). One of the top items on the to-do list for a Canadian is gardening. So, while you’re working in your garden this weekend we encourage you to think of some of ERDO’s gardening and agriculture projects around the world. 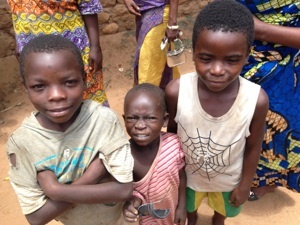 ERDO along with our partners has been providing food assistance in West Africa. One area of this work focuses on families who have suffered an 80% loss of crops, the majority of whom are woman-headed households. Families have been given seeds to help with their next harvest along with food to supplement their current needs. In Uganda, along with the Pentecostal Assemblies of God Uganda (PAGU), ERDO is helping to provide skills, seeds and tools to help target households in crop production. Just like in Canada we are seeing the impact of climate change on our weather patterns; Uganda is quite affected by climate change. ERDO with PAGU is addressing the climate change issues with disaster risk reduction, disaster risk management and adaptation. 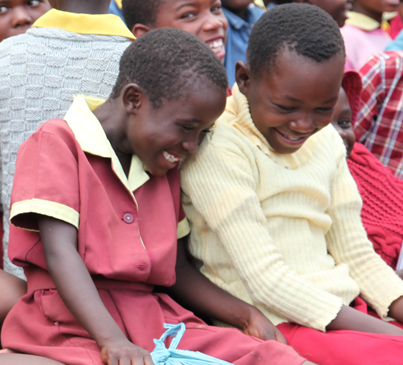 Every day over 17,000 children are fed in our in school feeding programs in Zimbabwe. 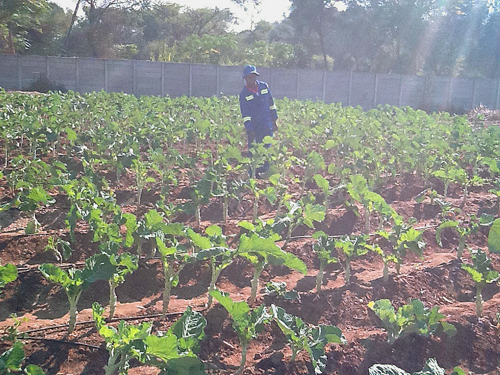 School gardens have been set up at 3 of the 35 schools where these feeding programs are run. These gardens were set up in 2010/11 by ERDO with help from matched funding from the Canadian government for initial seeds, tools and trainers. ERDO has also provided bore wells at each garden. We are teaching conservation farming methods to the parents of the children in the 3 schools with gardens. They can then use these techniques on their own land. This will improve their food security, as they will have more food to eat and can also sell some of the food they are able to grow. This coming weekend is an exciting weekend for many Canadian teenagers because it’s youth convention weekend. Through upbeat music, dynamic speakers and other events youth will have a great weekend learning more about God. Many conventions have also encouraged teenagers and their youth groups to raise funds to help with ERDO’s water and feeding projects. History Maker Convention in BC is raising funds for water filtration systems in Thailand. This will provide clean water for schools and their surrounding communities. Overflow Convention, in Western Ontario is raising funds for In School Feeding Programs in Bangladesh. Youth groups around Ontario have committed to sponsor a school to provide for their feeding program for one year. We’re excited to see how many schools will be sponsored. We’ve already heard encouraging news about schools that will be sponsored. 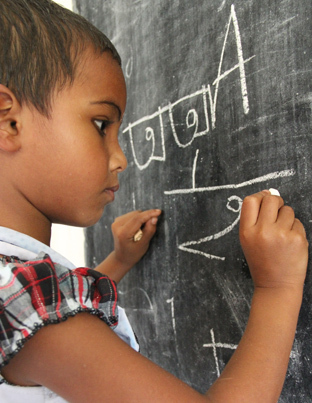 There are 109 existing Pre-Primary Schools in 13 districts of Bangladesh that are a part of this program. It is our hope that each of these schools will be sponsored and that 4,110 children between the ages of 4 and 7 years old will receive food assistance. Children will receive an early morning snack of High Energy Biscuits when they arrive before classes begin and a mid to late morning meal of a Wheat Soya Blend thick porridge. Increasing the children’s access to food 5 days a week at school will play an important role in improving their cognitive development and school attendance. In addition to the 4,110 children, 164 volunteers and 109 teachers will also receive meals on the days they work. This is especially important for the female volunteers who face their own hunger issues due to societal pressures. We pray for all the teenagers who will attend youth conventions this weekend, may they learn more about our amazing God! Thank you in advance for helping people in Thailand have access to clean water and for feeding children in Bangladesh. In both programs students are helping students; how cool is that?! The dark of night also brings the risk of disease in malaria prone areas around the world. ERDO is involved in Malaria prevention through education, water interventions and the provision of mosquito nets. ERDO is involved in educating communities about Malaria and what they can do to help decrease the risks of contracting the disease. This is a common theme in our multi-year programs. 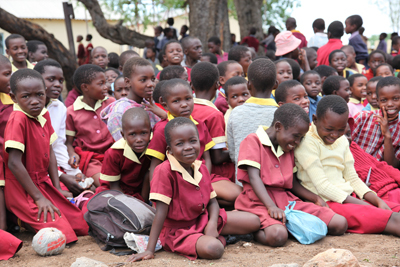 In Zimbabwe, 24,000 primary school age children involved in ERDO in-school feeding programs receive instruction about basic hygiene, diet and prevention of malaria and other diseases on a regular basis. Much of this work is done in partnership with municipal health officers and through strong partnerships with Medicines Sans Frontiers and other Health Based partners. In our Zambia conservation agriculture program, communities are introduced to insect repellent plants and instructed where to place them to decrease the number of mosquitoes around households and in fields where they work. Since 2009 ERDO has, in partnership with the Life Campaign and through other ERDO funding partners provided over 100 wells, to communities in need. Not only providing access to clean water for drinking, watering of animals and agricultural purposes but also significantly decreasing the issue of standing water (mosquito breeding grounds). Wells / water projects have been provided in Bangladesh, Thailand, Kenya, Uganda, Zimbabwe, Zambia, Mozambique, Guatemala, Ghana, Guinea, Burkina Faso, Senegal and Malawi. In Malawi, for the past two years, ERDO has provided mosquito nets for all children at ‘Children of Blessing Trust’ a home that works with children with disabilities. Mosquito nets in this area do not last for more than a season because the rats tear holes in them. Children of Blessing Trust provides rehabilitation services, special education services, Sunday School, nutritional support, specialized equipment, medical treatment and more to children and adults with disabilities. Many of the children who access these services are disabled as a result of suffering from a bout of Cerebral Malaria. This year 375 mosquito nets were provided to many grateful families. ERDO is also involved in the treatment of Malaria cases through medical clinics in Burkina Faso and Kenya. ERDO also ensures that funds are available to assist ChildCARE Plus program administrators in 28 countries respond to treatment needs of the over 6,750 children sponsored. In Africa, malaria deaths have been cut by one third within the last decade; outside of Africa, 35 out of the 53 countries, affected by malaria, have reduced cases by 50% in the same time period (reference: World Malaria Day 2013 Website, http://www.worldmalariaday.org/live_detail_en.cfm?id=796). There is more to be done to stop preventable deaths from malaria. 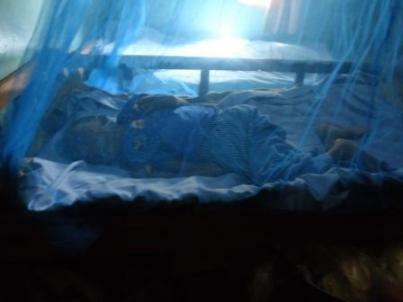 You can donate and provide mosquito nets to protect others from Malaria. This verse is our Biblical call as Christians to ‘do good’ in the world. Here at ERDO this is also our guiding mission statement and as a ChildCARE Plus (CCP) administrator, I am passionate about 'doing good' in our hurting world. As a child sponsor myself, I understand the underlining importance of child sponsorship in giving hope of a brighter future to children. Sponsorship makes a lasting impact not only in an individual child's life but also in their family and the larger community as children become educated and are able to reverse the cycle of poverty in which they are currently engulfed. 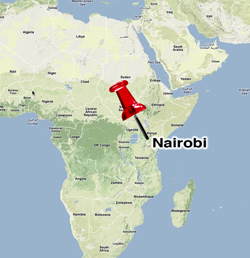 In the coming weeks, I will be traveling to Kenya and will have the exciting opportunity to visit my CCP sponsored child, Destiny, and her family in the capital city of Nairobi. This will be my second trip to Kenya in the past three years, a country of beautiful landscapes and people with warm hearts whose genuine hospitality and boundless faith, I have quickly come to love and admire. I am greatly looking forward to visiting the CCP program in Nairobi and seeing how children's lives are being transformed every day through the loving support of ERDO-ChildCARE Plus sponsors. 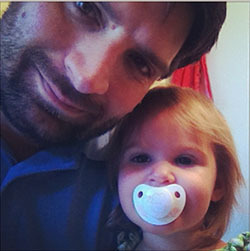 I am so looking forward to meeting sweet little Destiny! 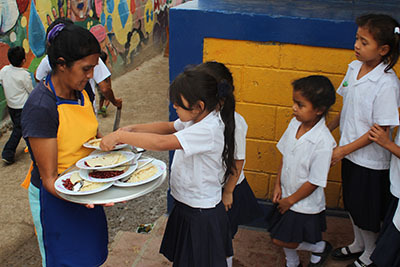 This in-school feeding program is in one of the poorest urban areas in Tegucigalpa, the capital city of Honduras. The residents of the area initially settled here after Hurricane Mitch destroyed their homes in 1998. Families in Buena Vista, Nueva Capital and Mary Flakes de Flores live on two to three dollars per day and unemployment is rampant. The neighbourhoods here are plagued by gang violence. Few children stay in school long enough to graduate from Grade 6 as they are lured into the gang subculture with offers of food and money. 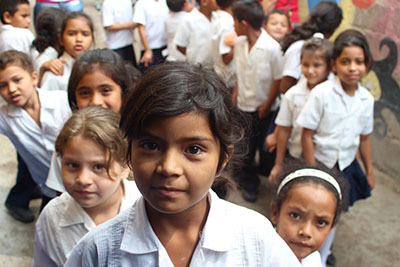 This program seeks to supplement the Government of Honduras’ commitment to providing three months of food annually to impoverished schools by providing seven months of daily feeding. Students will be more equipped to learn without the distraction of hunger and will be able to stay in school. Last December I had the opportunity to visit Thailand, otherwise known as the land of smiles. On this trip there were many smiles shared; I am grateful for the opportunity I had to meet two of my sponsored children, Nampfon (currently sponsoring) (age 13) and Fung (sponsorship completed) (age 23). I met Nampfon and her mother in Chiang Mai. Cavell, the ChildCARE Plus (CCP) administrator, kindly did the translation for me and we were able to speak to each other. It was a very happy moment to meet Nampfon personally and learn that she likes to study, especially science. It is her dream to become a nurse. I trust that she will. I sense that she is determined to reach this goal. Together we attended a Christmas celebration at her church. After we said our goodbyes and they had to return home. 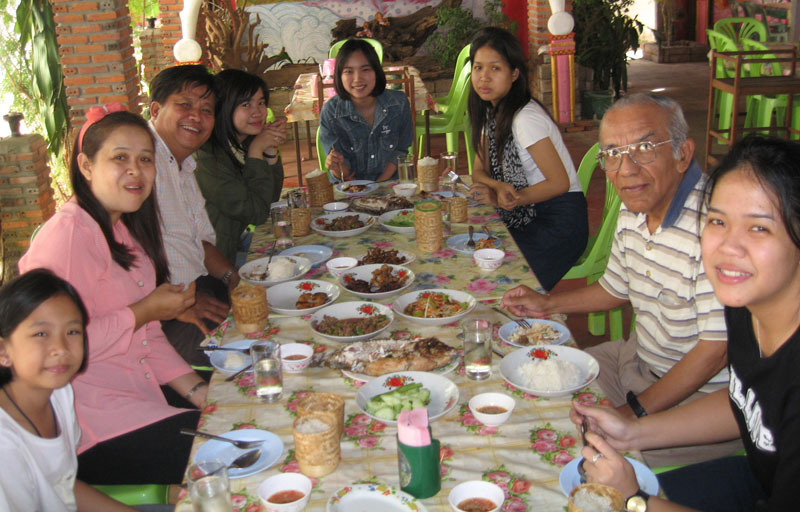 Another day, Fung's father, her family and I went to meet Fung about an hour away from the family’s home. She travelled all day, ten hours by bus from Bangkok just to be able to spend one day with us. What a privilege for me to meet her! It was a very special encounter for Fung and her family. I sponsored her for 15 years; I started sponsoring her when she was in grade 2. 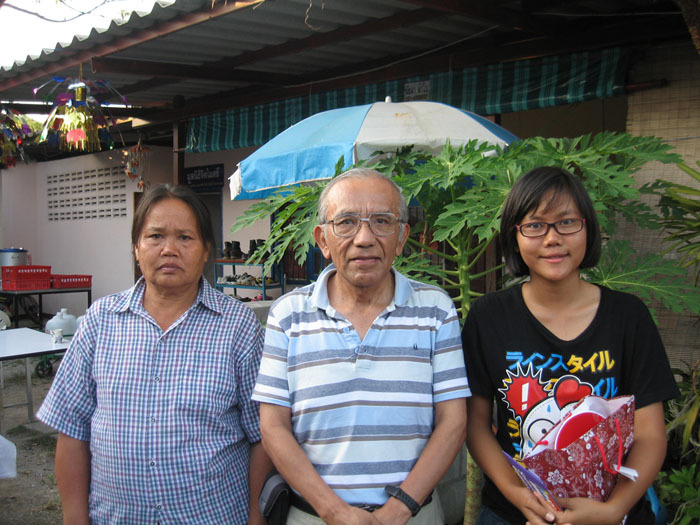 Now she has finished her university studies and working in a cable vision company in Bangkok. I was blessed to be with Fung's family for a few days. Their hospitality was remarkable, very friendly, and ready to help. We shared many moments together. Thanks be to God for such a family, who care for others! The love and care of Fung’s parents, the guidance and assistance of CCP in her education, health and spiritual growth in Christ has prepared her for her future. She is now equipped to face the challenges that life brings along the way. I am confident that the good work which started in her heart by God will continue, so that others may also be blessed. M ama Sifa is a woman from our newest lending post, through Wezesha Project (Congo Microfinance) Nyawera, in the city of Bukavu. 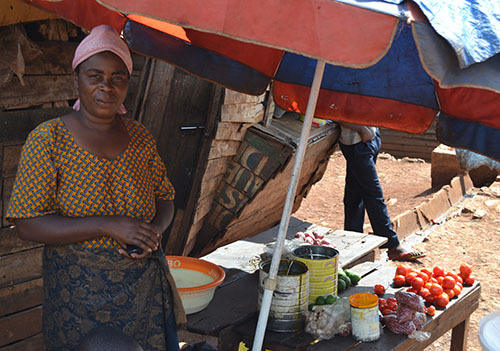 She was among the first 30 borrowers to receive a loan to expand her business. 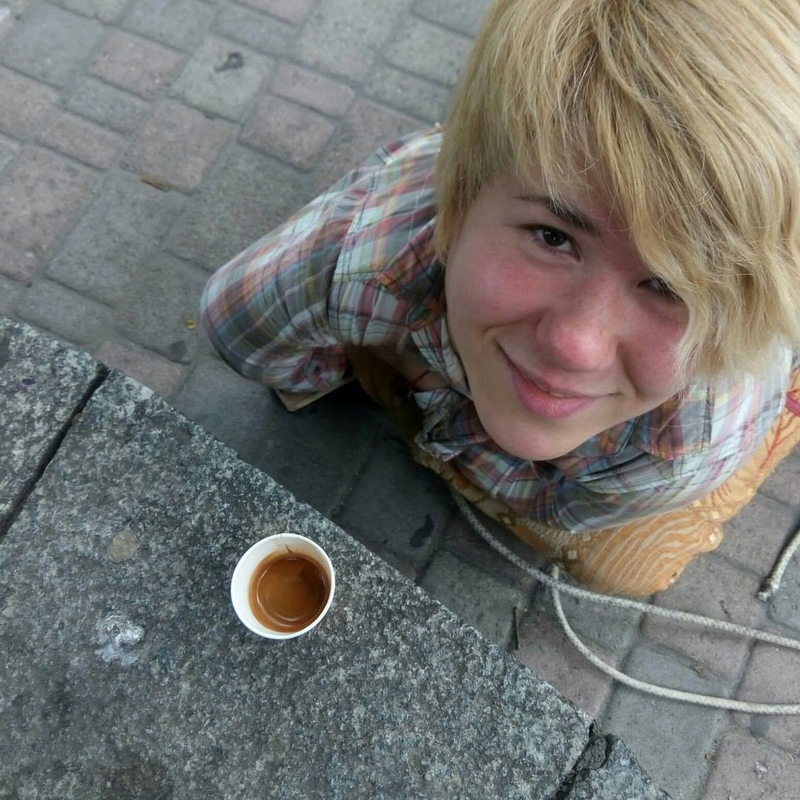 In this picture she had just received her first loan of $50USD. Overnight it made a huge impact because her entire business consisted of only $15USD of investment. A few days ago, I received a retailer’s e-mail solicitation with the subject-line: “You deserve some Easter savings”. Before I put it in the garbage I thought about the implications of those five little words. If I was to truly believe that a new set of “Easter pots and pans” was my highlight of Easter, at least until the next sale, my soul would be empty approaching this most Holy week. As we remember Jesus’ crucifixion on Good Friday, and celebrate his resurrection on Easter Sunday, be sure to remember the central message here: “God so loved the world that he gave His only son” and as we look toward him and that love, we know he died for our sins and are drawn into eternal life. Now all of us are looked at and known in love by the Father. Now that’s definitely a message to flag, celebrate and keep at the top of your in-box. We've reached a milestone for Wezesha Project - ERDO's Microfinance program in Eastern Democratic Republic of Congo (DRC). We are now sustainable. This means that we are able to cover all of our local operating expenses, which includes local salaries, office rent, transportation, and communication. The interest that we collect is now able to pay all of the costs; every dollar that is put into the project remains in the project. This major milestone separates us from many other initiatives. This milestone means that new donations will provide more loans to women in need. We anticipate further growth of this project. 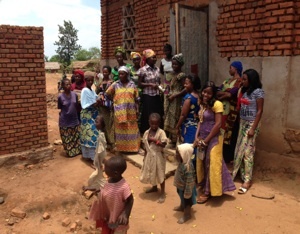 If you’re interested in helping to provide a loan for a woman in DRC go to www.erdo.ca/microfinance-wezesha and click on the donate button. 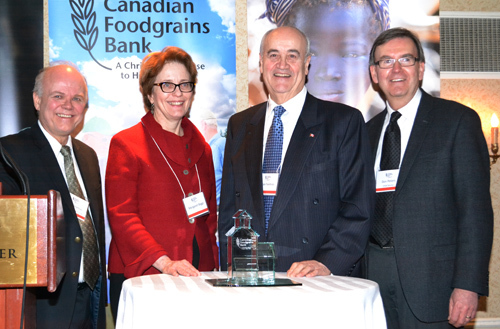 On March 5th 2013 a reception was held to celebrate the 30th anniversary of the Canadian Foodgrains Bank. Staff from the Honorable Julian Fantino, Minister of International Cooperation Minister’s office and from CIDA, Members of Parliament and Foodgrains Bank members, supporters, and staff attended the celebration. ““It speaks volumes” that 40% of the donations for the Canadian government’s 2012 Sahel Crisis Matching Fund came through the 15 churches and church agencies that make up the Foodgrains Bank” says the Honorable Julian Fantino. During the celebration, the delegations offered thanks for Canada’s support for the Foodgrains Bank, and for efforts to reduce hunger and poverty in general, and expressed the hope that Canada would continue to be generous with its foreign aid in the future. We are grateful for our partnership with the Canadian Foodgrains Bank (CFGB). ERDO was one of its founding members. Congratulations staff of the CFGB on 30 great years! We look forward to many more! In urban and suburban Canada there are more and more children who have never seen a live horse or cow, and a whole young generation that doesn’t understand just how important livestock and farms are for survival. In the next few weeks, fairs that celebrate livestock will be taking place right across Canada. From the Western Canadian Livestock Expo in Saskatoon to the Royal Manitoba Winter Fair in Brandon Manitoba, and the Ottawa Valley Farm Show, these fairs are an important time for Canadian children to learn about the magnificence of many animals and our deep connection with nature. Emergency Relief & Development Overseas (ERDO) recognizes the connection between people and animals and so operates with our partners in a number of programs to provide education on taking care of animals that serve people - otherwise known as animal husbandry. Educating people on how to take good care of their working animals ensures the animals live longer lives with the proper nutrition and care they need to avoid sickness and suffering. The link between humans and their work animals is a critical one; if the animals that work farms, or carry saleable goods and supplies are kept in good care, the family has a higher likelihood to earn an income and care for their own family. During the East Africa food crisis, people were suffering, but what many people didn’t realize was that the drought and famine had a severe effect on animals too. In Kenya, ERDO led an initiative with our partner Sauti Moja to assist 117 pastoralist widows by providing fodder for their livestock and provided funds to restock lost animals for 68 families. In phase two of the crisis response we assisted another 350 households with livestock. 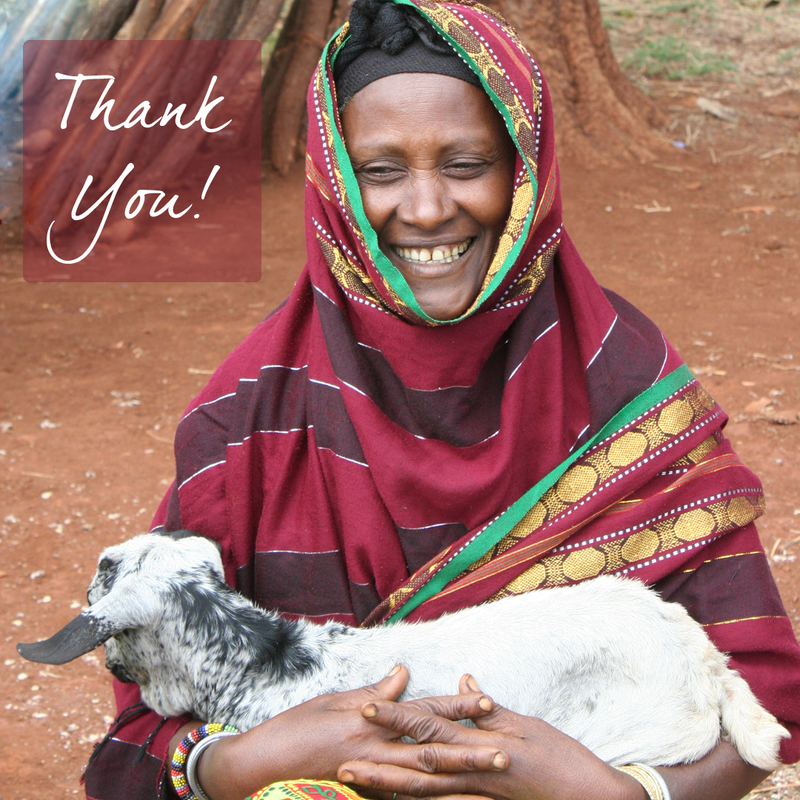 Thanks to the generous donations to ERDO at Christmas time through our “gift catalogue”, we were able to provide 273 goats, 14 donkeys and 5 camels for widowed women. As we celebrate animals and agriculture in Canada this spring, we also give thanks for those people who provided animals and fodder for animals so that families could save their animals from starvation and keep their family’s access to food more secure. We live in a culture that believes we can buy protection: from our toothpaste with its tartar-fighting powers to our full protection from the sun through special creams and lotions. We buy warranties, alarm systems and other coverage to feel a sense of security on any given day. Two years ago, families in Japan woke up on a day just like any other and set out to brush their teeth, drive to work, walk to school, and go about their lives just like on an average day. Some might have felt the same sense of familiarity and security that we in Canada do when we think that our lives are well protected by all the things we have done. That sense of calm was altered dramatically when an 8.9 magnitude earthquake struck eastern Japan on March 11 2011, and caused a life-changing tsunami. The water, which was a source of income for so many living in the area, was changed into a force of indiscriminate destruction. The once industrious coast was pushed inland, leaving a jumble of cars, homes and bodies. The media this weekend and today are running stories to commemorate this somber anniversary. There are also many reports about the bits and pieces of people’s lives washing up on the shores of British Columbia. Boats, shoes… all of the items of life that didn’t find their way to the ocean floor are finding their resting place along our country’s coastline. They are a haunting memory to not forget those whom the water and destruction took that day. At ERDO, we take this day to remember those who were lost and those who today grieve lost loved ones. We pray for many Japanese people who are alive and suffering from post-traumatic disorders, unemployment, depression and homelessness. We pray that Japanese Christians will continue to deliver the message of a loving God, and come alongside people in need. In this time of reflection, we are so grateful for our partners in Japan who delivered the programs that Canadian funds donated to ERDO enabled: PAOC Global Workers, Assemblies of God-Japan, FHI, Convoy of Hope, Canadian Churches in Action and CRASH (Japanese NGO). Click here for more on ERDO’s response to Japan after the tsunami. Some young Canadians attending college and university have just returned from reading week, while others are enjoying the last days of their break, with some celebrating in southern climates and others catching up on some of their sleep and studies (and laundry). While some form of post secondary education seems like the norm for young Canadians, in many developing countries there are serious challenges that prevent children from reaching their full potential and achieving their education goals: poverty, illness, civil conflict and natural disasters. Consider that in some of the countries where we work, less than half of the population can read and write. In many of the countries where ERDO serves, education is the key to set a child free from poverty, and is a highly valued gift. At a time of year when our own loved ones are diving into their textbooks and expanding their minds, we’d like to give thanks to all of the people who sponsor children through ChildCARE Plus and help those children to receive an education, and reach their God-given potential. ERDO's new website launched today after almost two years in the making. We wanted to create an electronic space where children's stories would come to life so that they could be quickly and easily sponsored. We also wanted to make the breadth and depth of our program work visible, and to tell the stories of those whose lives were transformed. In addition we wanted to build a place where you'd find the resources that you need, and that you'd be happy coming back to. We welcome your feedback on things that work, things that don't work, and what your overall impression is of the site. Please explore, and tell some friends! With thanks, the ERDO team. If you’re in any retail store it seems that as soon as November 1st hits the décor and season changes to Christmas. We start to hear Christmas songs and begin making plans to continue our Christmas traditions. As we begin compiling our shopping lists we often find we have friends and family that are difficult to buy for. What if instead of another box of Christmas cake, a festive tie, or the latest electronic gadget you gave a gift through ERDO and were able to bless not only your friends and loved ones, but others in need? The difference that these gifts can make is simply amazing! 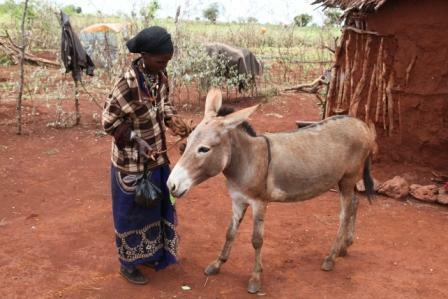 The gift of a donkey, camel or goat changes the lives of the widowed women in ways we cannot imagine. They now have the time and opportunity to cultivate small gardens to grow their own food. A donkey allows them to haul water for irrigation, and the hardy camel has even been used to plow fields. They are able to spend more time with their children, and both mothers and children benefit from the release from grinding labour with little reward. Life is still difficult, but now there is hope. So maybe your Christmas gifts will look a little different this year: gifts like goats, donkeys and camels. What an amazing impact these animals could have for families in need! Thanksgiving always brings about a time of reflection. Here at ERDO we have lots to be thankful for. We’ve only mentioned a few ways that you have helped us to make a difference; there are surely many more. Thank you for all you have done in the lives of children and families through your generosity! We’re so excited about a new idea to continue to raise awareness for the issue of Global Hunger. It’s called "A Recipe for Ending Global Hunger." Churches and individuals accross Canada can fill out the recipe cards, like the one pictured here, and send them on to Prime Minister Harper. We’d like to encourage our prime minister and other international development decision-makers in Ottawa to keep global hunger in the federal government agenda. So far we’ve had 50 churches across Canada request cards, representing a total of 6,325 cards that could be sent to the government and we are still receiving orders! ERDO represents just one of the fifteen organizations that make up the Canadian Foodgrains Bank, who are a part of this campaign. So if every organization is able to see a similar response that already equals a lot of cards that will be on their way to the Prime Minister’s office! Want to join us? There’s no deadline on this campaign. Send an e-mail to info@erdo.ca to request your recipe cards and let us know how many you’d like. You can also check out our Youtube channel to watch a video about this campaign. In early August a Typhoon hit the city of Manila in the Philippines leaving many families along with their children homeless. We were able to respond to the devastating needs for 600 families. These families received urgently needed supplies, emotional and spiritual support through global worker Marilyn Curtis. Some of the supplies that were provided were water containers, rice, fresh food, powdered milk, canned food, baby formula and basic medicines. Families also each received a mosquito net which will protect them from the increased risk of malaria carrying mosquitos. ERDO will continue to be involved with organized feeding programs for people in Manila. For most Canadian children there is no real danger awaiting them in the dark. 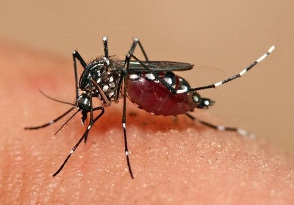 For children living in malaria zones, the dark can bring real fear in the form of malaria-carrying mosquitos who bite during the night. 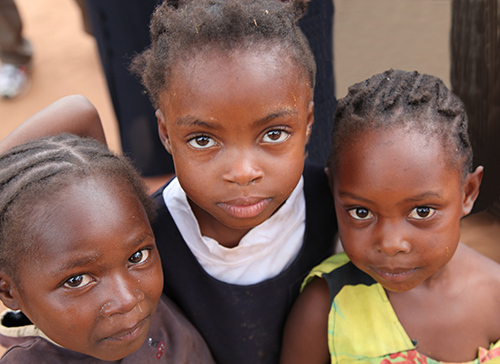 With 86% of all malaria deaths occurring in children under the age of five, ERDO is focused on doing something to protect these young lives by providing mosquito nets. In the past three years mosquito nets went to Senegal, Burkina Faso and Malawi. This summer along with MAK (Missions & Kids) of the PAOC, children are raising funds for mosquito nets. This is a practical way that children in Canada are making a difference around the world. ERDO is also involved in the area of educating communities about Malaria and what they can do to help decrease the risks of contracting the disease. This is a common theme in our multi-year programs. In July 2011, following a prolonged drought, the United Nations declared a state of Famine in Somalia. Though now declared "famine free", Somalia and other countries that form the Horn of Africa are still facing serious food security issues in the coming months. In fact, the US Agency for International Development's Famine and Early Warning Systems Network warned in an April 3rd report that due to less rain than previously forecast, the size of the food insecure population is expected to increase. ERDO is working through Canadian Churches in Action, and through our on-the ground Global Worker, Marilyn Curtis, to respond to children and their families affected by the recent floods in the Philippines. Typhoon Washi, known locally as Sendong, wreaked havoc in the Philippines in December 2011, battering the coast around Cagayan de Oro, Iligan and Bukidnon. Exact numbers of the people affected are difficult to confirm. Approximately 1,300 houses were destroyed and around 3,000 more damaged. An estimated 45,000 people - including 14,000 children - are being cared for in 48 evacuation centres. A further 43,000 people are being helped outside the centres because there is no space left within. An estimated 800 people are unaccounted for, although exact numbers are difficult to come by. ERDO's response to help victims of the typhoon included clean drinking water, anti malarial drugs, tarpaulins and blankets. Our response working through Marilyn Curtis helped bring relief to 1,000 people. "One lady shared with me of how she with her husband and six children were asleep, when the mud hit their house, she was swept up a tree and able to hang on. Suddenly she felt "something" touch her legs she reached out and grabbed it.. it was a baby, she held on to the baby not knowing whose baby it was, she knew that all her family was swept away by the fast flowing mud. When daylight broke, still clinging to the child, she had realized it was her own baby she had saved, she said, she had thought of letting the baby go several times during the night, thinking she had lost all her family! When I met her, she was holding on to that precious child so very tightly not allowing anyone to hold it. We sat and wept together." Imagine an area from Vancouver, BC to Portland, Oregon–almost 500 km–under water. Every house, business, industry, road or hospital under as little as 10cm and as much as 4 metres of dirty and polluted water. That would be news wouldn’t it? Imagine a population the size of Vancouver proper–every man, woman and child (660,000 for those reaching for Wikipedia) losing their work over night with no prospect of returning for months, no unemployment insurance and no bank account. That would be news, wouldn’t it? Imagine a city the size of New York City and Greater Toronto combined told to evacuate while you can. That would be news wouldn’t it? But it’s not. Buried deep in the National Post or New York Times you’ll find an update, and yes, finally the Globe and Mail has caught on, but let’s face it, floods are not good disaster stories. They take too long, drag out, leave too many people alive. It’s death by a thousand cuts. But that’s the story here. Those numbers listed are still conservative, for we all wait for the final, painfully slow act in this drama–Bangkok’s fall. This is the flood that never ends. Raining when it should have been sunny, our summer hot season was the soggiest on memory. Flooding began in the North two months ago, and the water run-off of endless tropical storms has accumulated in the Central Plains, pushing south through the only exit it has–Bangkok. How much water? Imagine a lake 75% the size of Lake Ontario draining through your home town. For our family so far it’s been an inconvenience. We prepared our home for flooding and stored precious photographs; our three kids are at home since school is closed for at least three weeks (or so they say); we’ve stocked up on basic food and supplies, but still we are not wet. For hundreds of our church members this is not the case. For millions of other Thai, they are out of home, without work and faced with the task of rebuilding once water is completely drained in December. Countless homes with their contents are under water. We’ve listened to stories from Pastors of flooded churches in Central Thailand and Greater Bangkok. All were under water. Church members either survive by living on the second floor of their home while waiting for help or are relocated to other provinces to wait. Lots of water means no work. No work means no food. Lots of water also means not enough water–drinking water that is. The primary needs here right now is lack of clean, drinkable water, food and boats to get these valuable necessities to stranded people. Fortunately, we can help some. Our experience over the last three years with providing clean water means that Imagine Thailand is now installing water stations at over 22 church locations in Greater Bangkok. The systems can use the city water sources, clean the water and community members can take it away in plastic bags.